Hellebores, Hostas, Hydrangeas, Heucheras, Heathers, Hemerocalis, Helenium, Helianthus, Honeysuckle, Hyacinths, and a weird little fellow called Hieracium or Spotted Hawkweed ‘Leopard’, also there is a lovely Hippeastrum in my tea room! 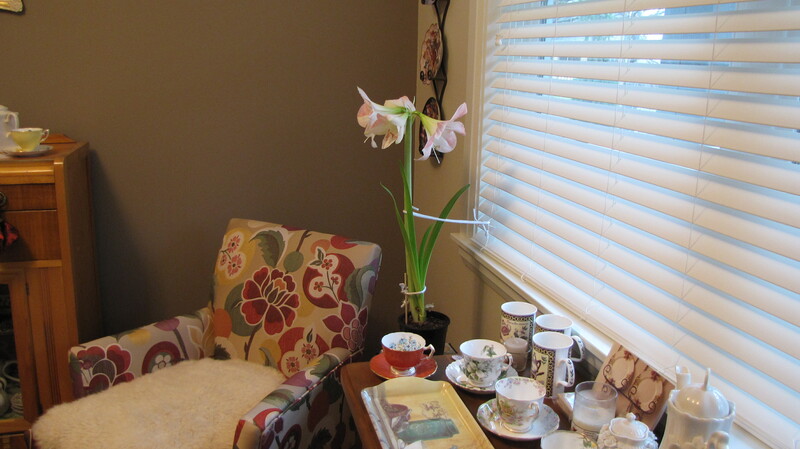 The hippeastrum I have in my tearoom is often mistaken for an amaryllis, or is an amaryllis mistaken for a hippeastrum? 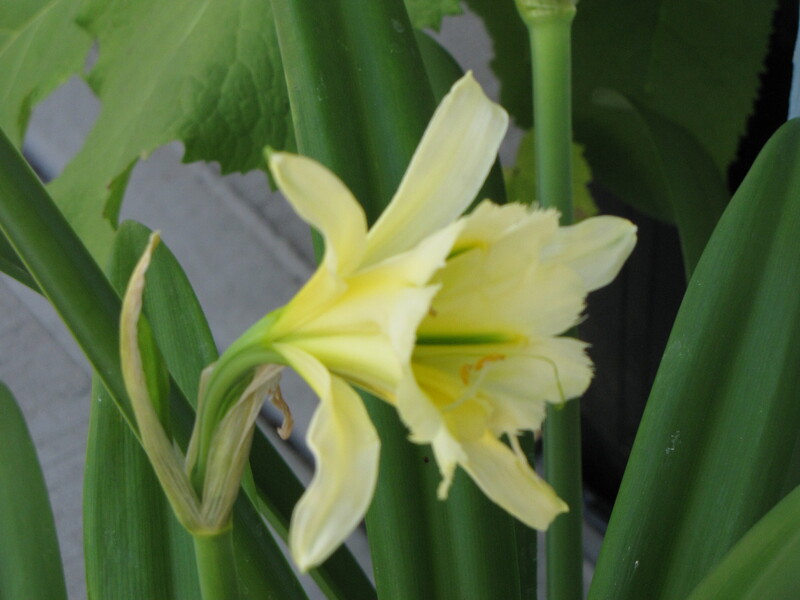 True amaryllis are from the Western Cape of South Africa and grow outdoors in this unique climate. 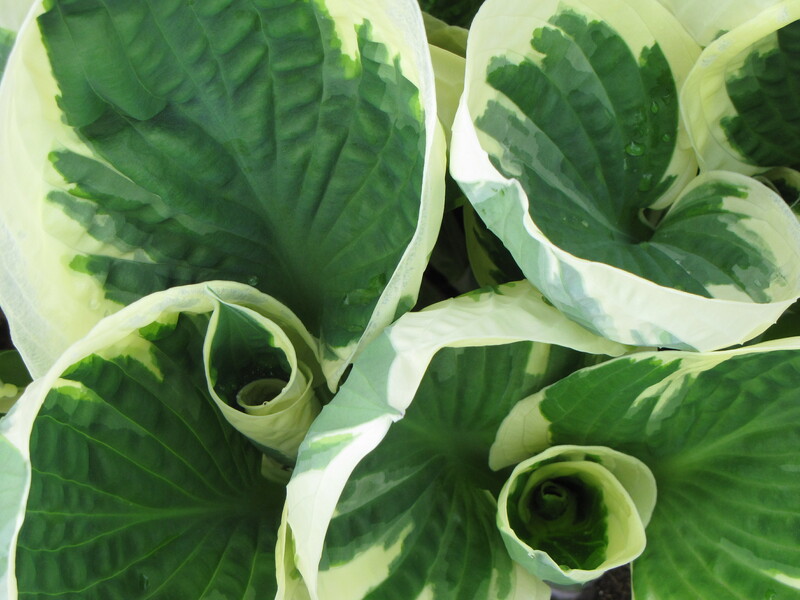 The plants we grow indoors during winter are really called hippeastrums. 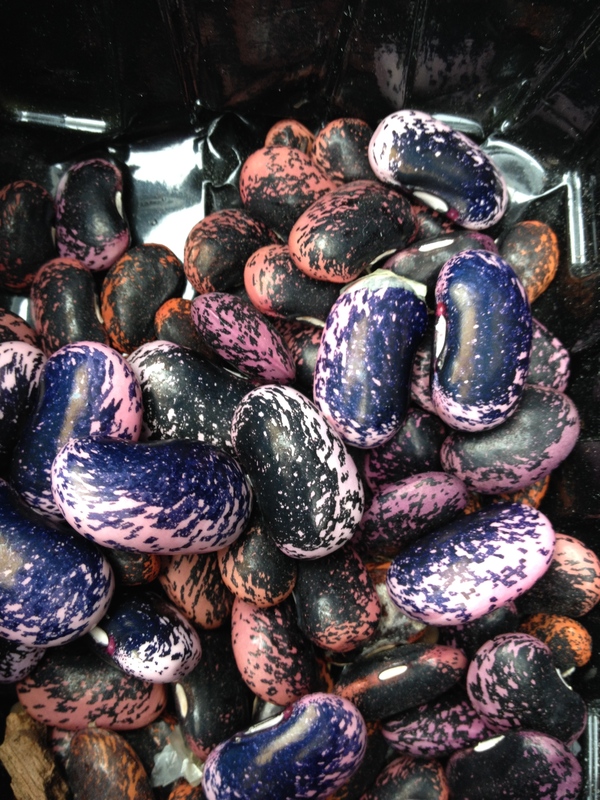 Scarlet Runner beans are a legume or fabaceae, they can be grown for food or as an ornamental. 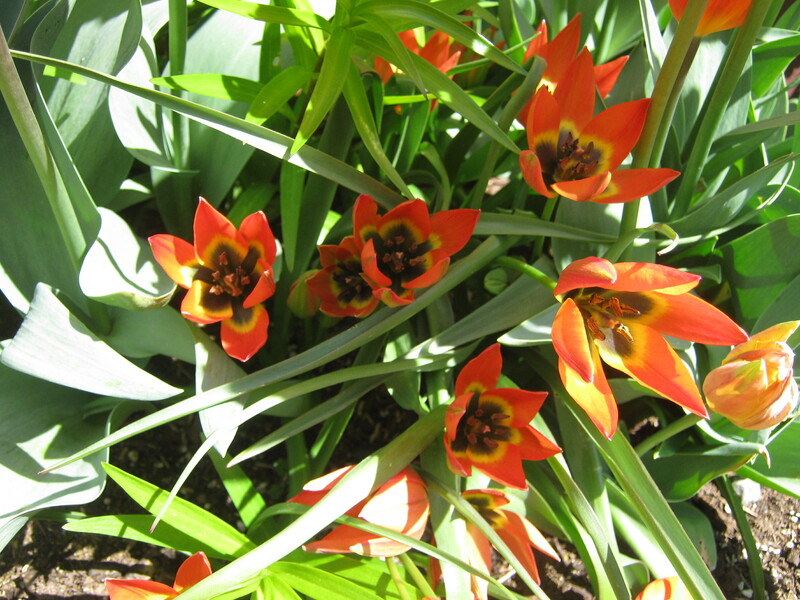 The binomial name is Phaseolus coccineus and they were one of the first things I ever grew. Someone gave me the seeds and I remember thinking how interesting they looked. For me they are probably the easiest plant I have ever grown, this past spring I shoved 12 seeds into the pot with my fall chrysanthemum and now I am harvesting about 20 good-sized pods. The seeds are ones that I collected years ago, packed away, and when we moved just this past spring I found them buried in a bin of gardening stuff. They still went on to produce a crop of beans! Because I grow scarlet runners for ornamental purposes only, I let the pods go brown and dry before harvesting, the seeds inside are big with lots of fun spots. I decided to leave the green pods on the vine a bit longer, if we don’t get any frost the beans will come back but here in the Fraser Valley the chances of a frost-free winter are unlikely. I will now share these seed with other gardeners. My hosts are surprisingly thriving in the heat, we did have a shower last night so that was a relief! They are so reliable having been dug up when we moved and then put into large pots along the side of the house but they seem to like it. 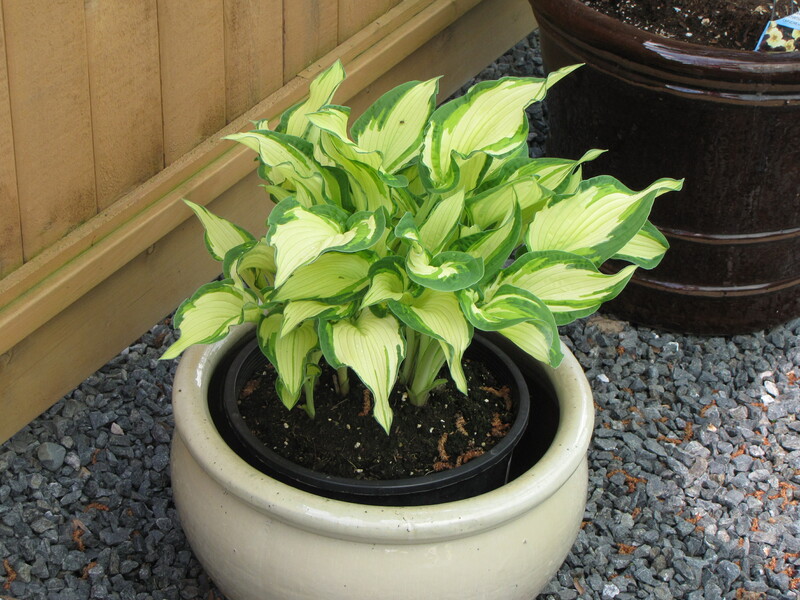 Hostas are the one plant that frankly I can’t tell one from another. The new introductions look so similar to ones available I just find it easier to name mine for the people who gave them to me! 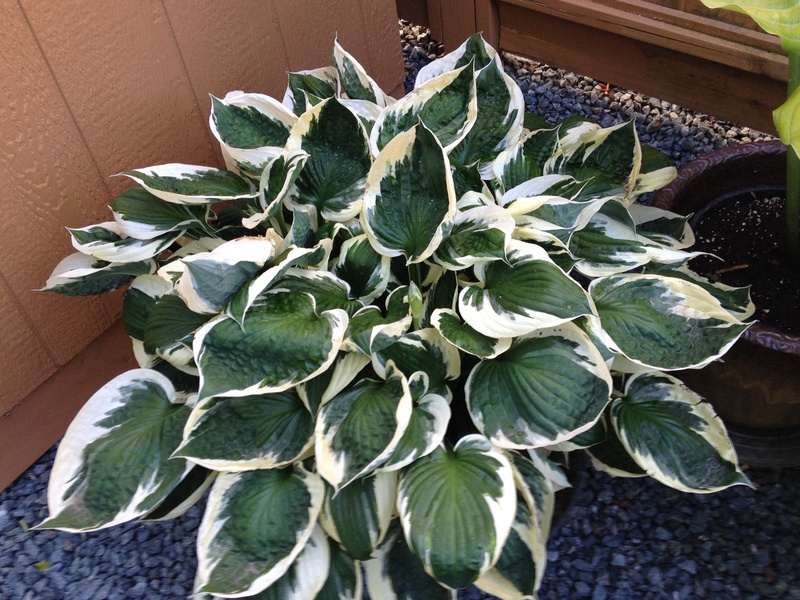 “Big Whalley” I purchased this hosta from Wallmart this past spring as i fell in love with it’s massive leaves! 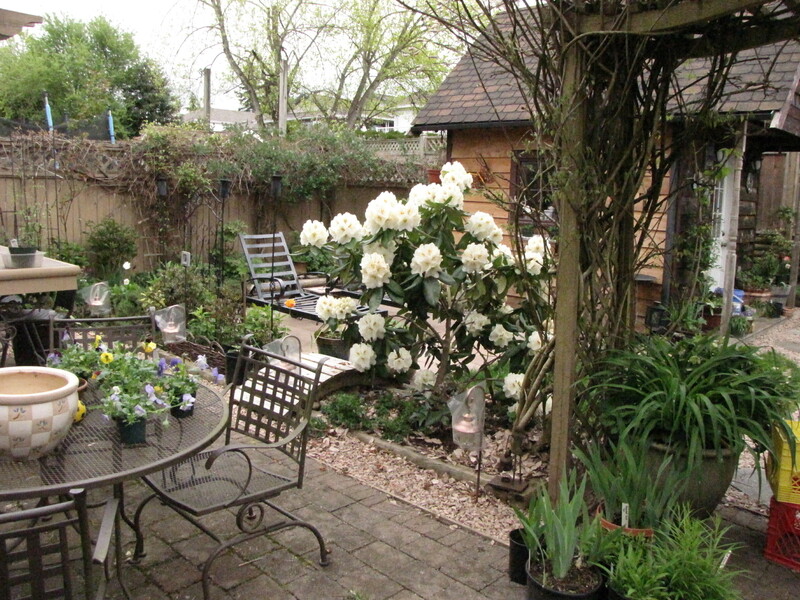 I have to say I am very pleased with how well my plants are doing in my new garden. 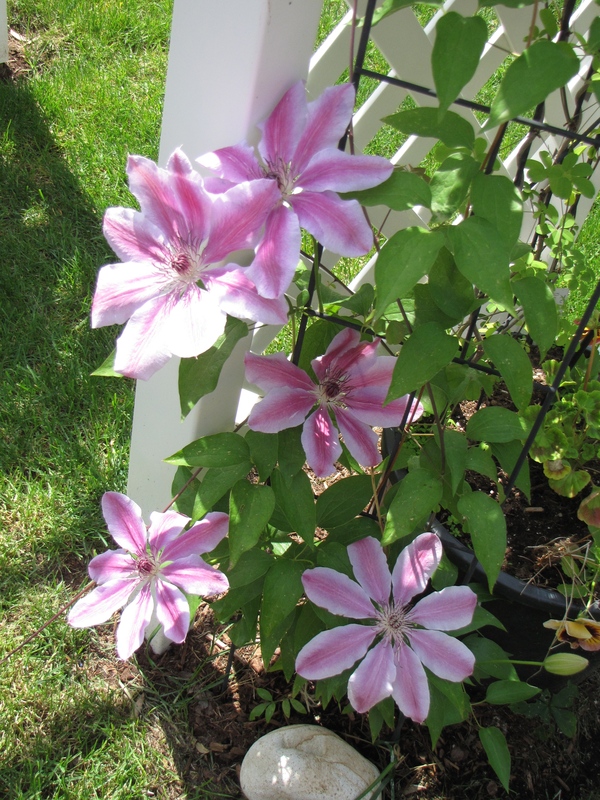 Many of them including my clematis were either swallowed up by other plants or they simply never bloomed in my previous garden are sure putting on a show this spring! 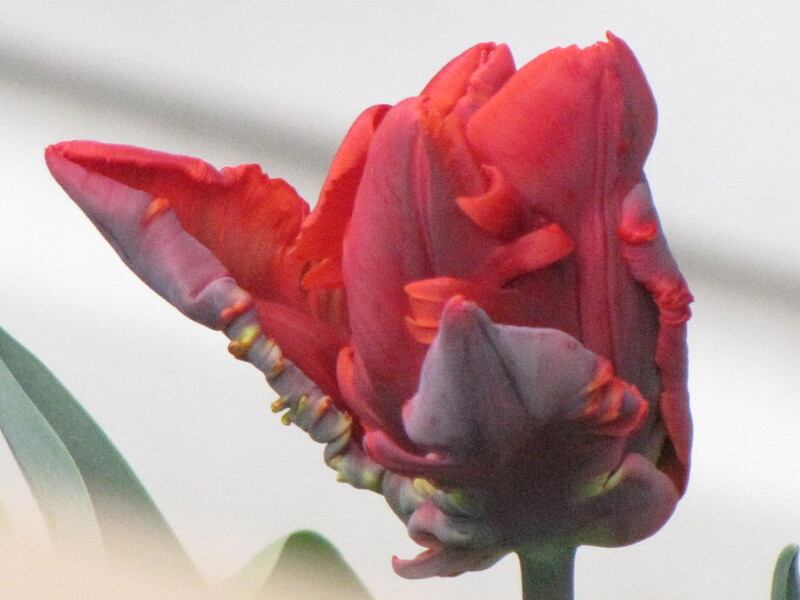 Previously, I was lucky to get one bloom from my Nelly Moser, now it has lots! 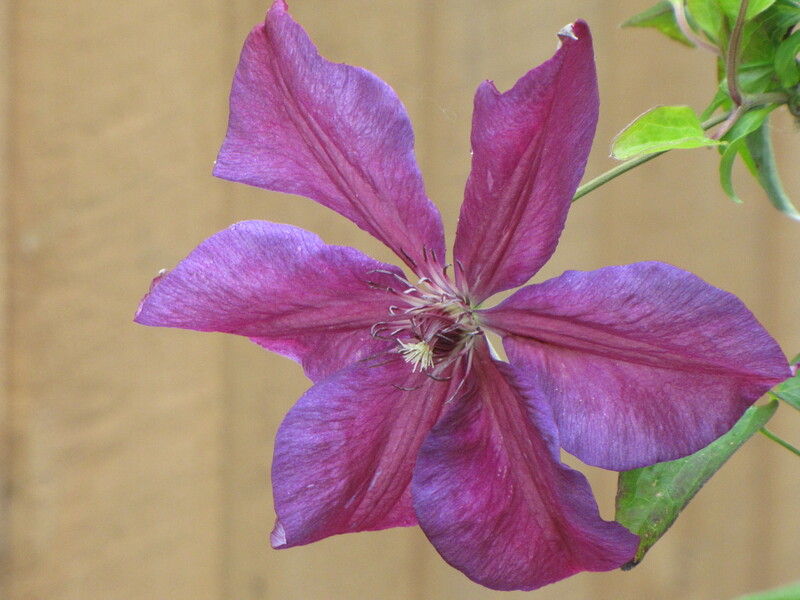 Nelly Moser is a bi-coloured clematis of pink and mauve with dark purple anthers (middle). 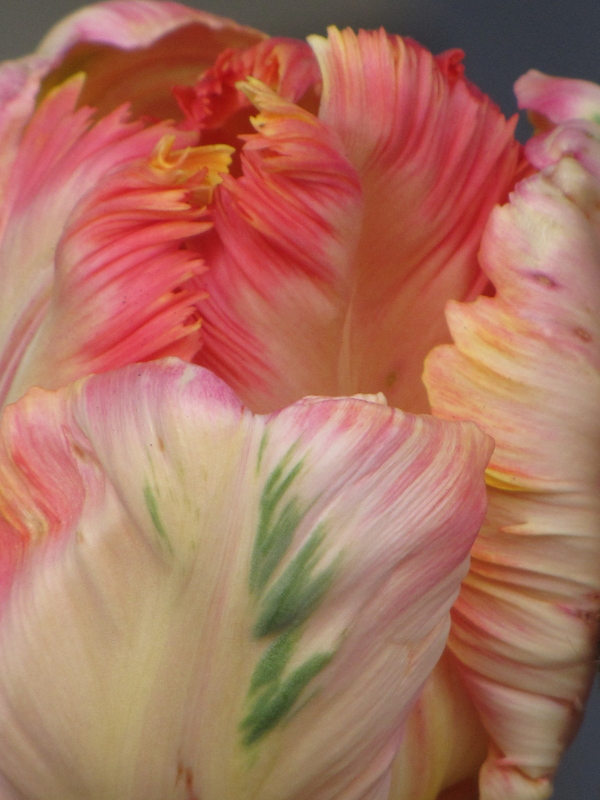 It is a heirloom hybrid bred by Marcel Moser of Versailles France in 1897. He crossed clematis ‘Marcel Moser’ with ‘Belisaire’ and came up with ‘Nelly Moser’. 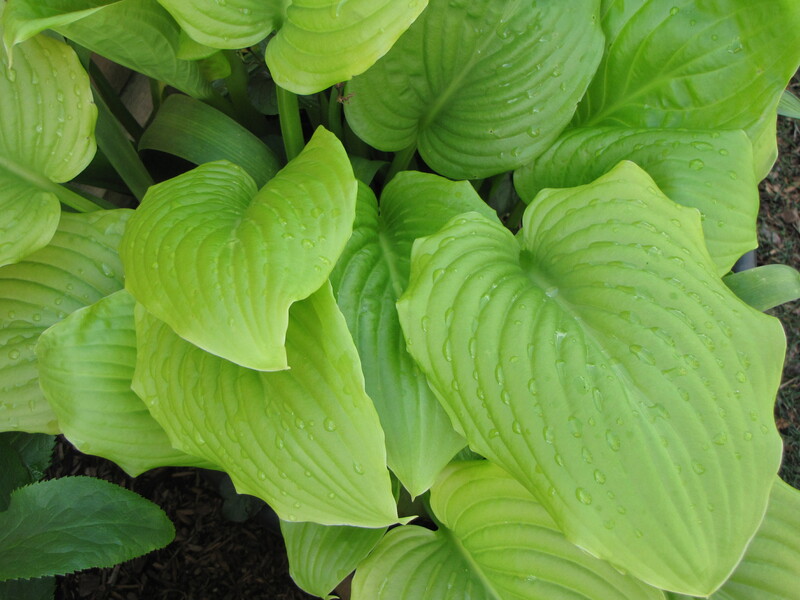 Even people who are not gardeners can appreciate this amazing plant! One of my oldest and toughest clematis is Mrs. N. Thompson! 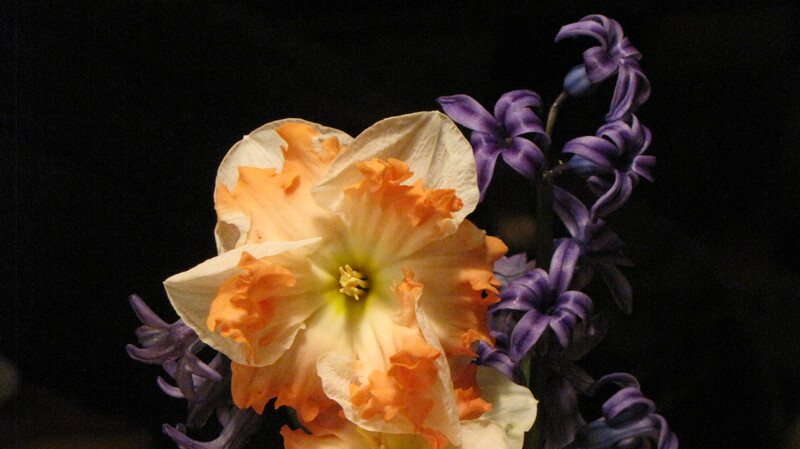 I have had it for over 17 years and it is still blooms faithfully each year. 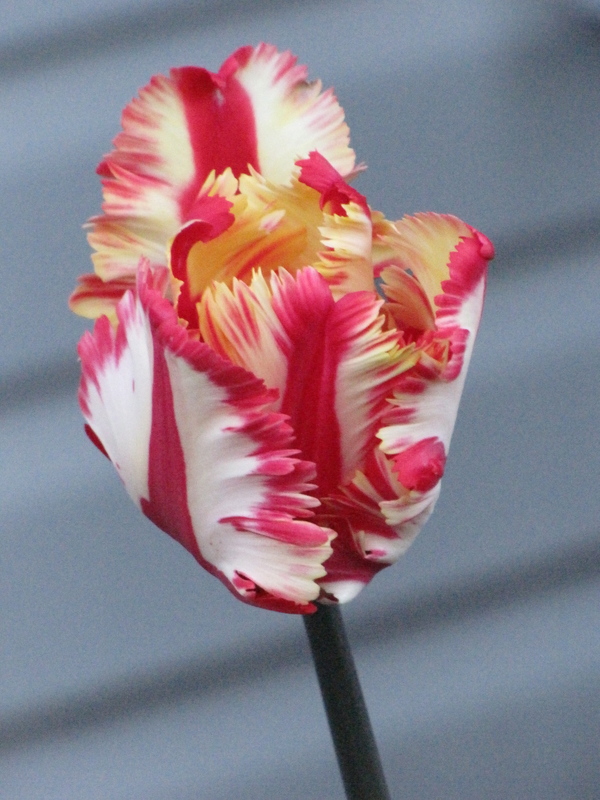 It was even in the path of the latest wind storm, it did suffer some damage so I tied it up with more supports and with a broken stem she still gave me a bloom! 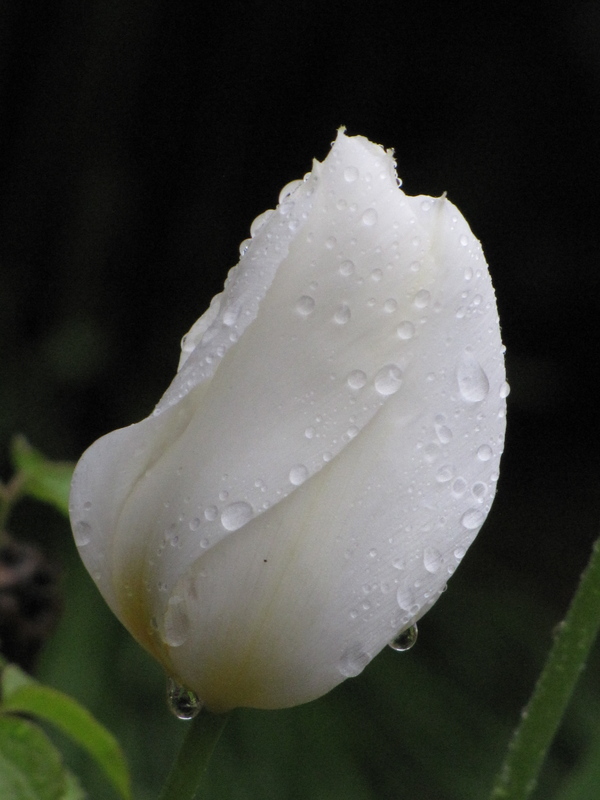 The only history I could find was it was named for the lady who found the plant, a Mrs. Nelly Thompson. 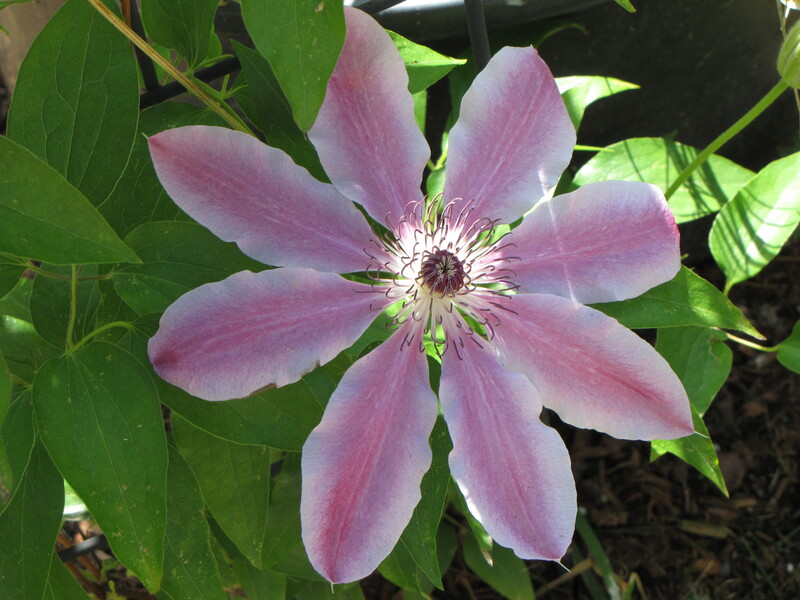 Now I like to collect “H” named plants so when I came across clematis ‘Honora’ it was coming home with me! This clematis has always been in a big pot but it never seems to suffer for it. It has one bloom open but another 20+ are on the way. 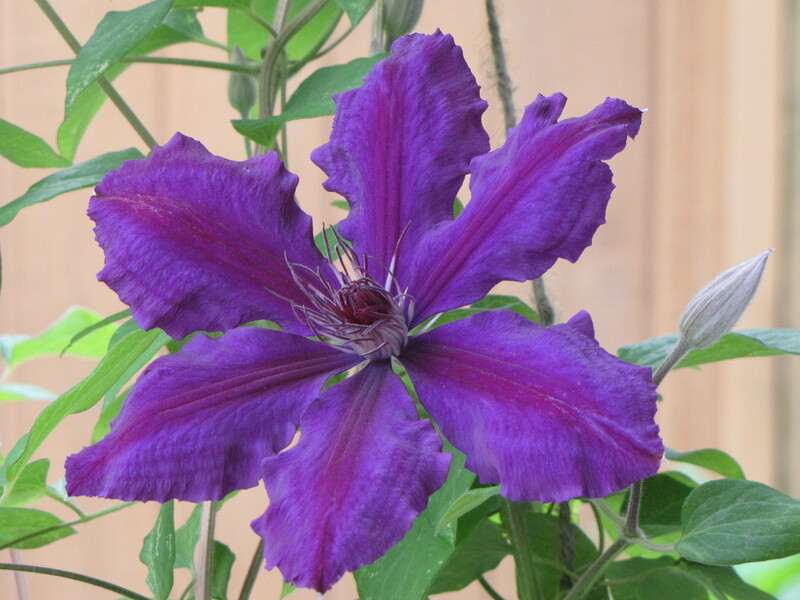 Its a lovely clematis that to me looks like velvet with its plush, ruffled petals. Check back for the other clematis that are still to bloom: ‘Elsa Spath’, ‘Will Goodwin’, and ‘Golden Harvest’, I have 2 more but not sure of their names. 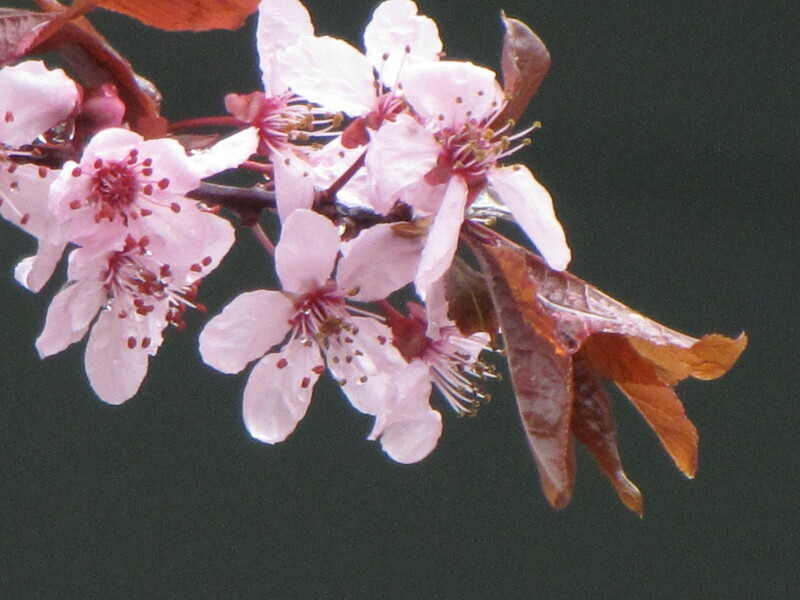 I love it when the cherry trees start to blossom! It’s a time when the most scruffy, dead-looking tree suddenly comes a live and is covered in flowers. 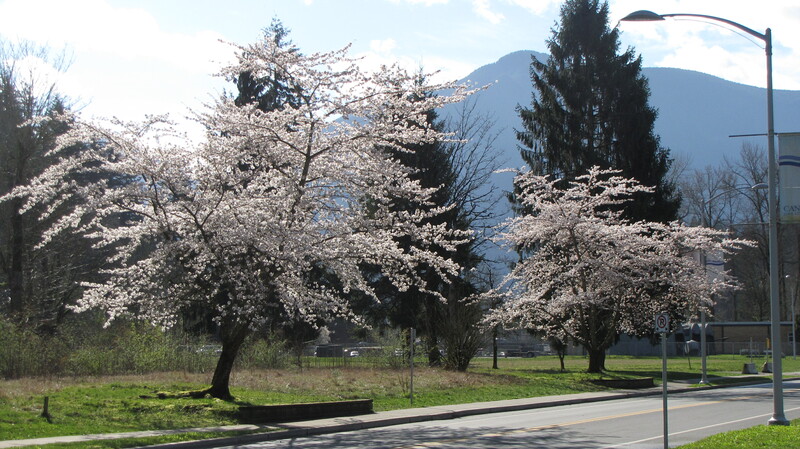 In my area the cherry trees line the streets, they are in the parks, playgrounds and they even grow out of the ditches a long the side of the road! Its such a nice sight, even if its for just a short time. 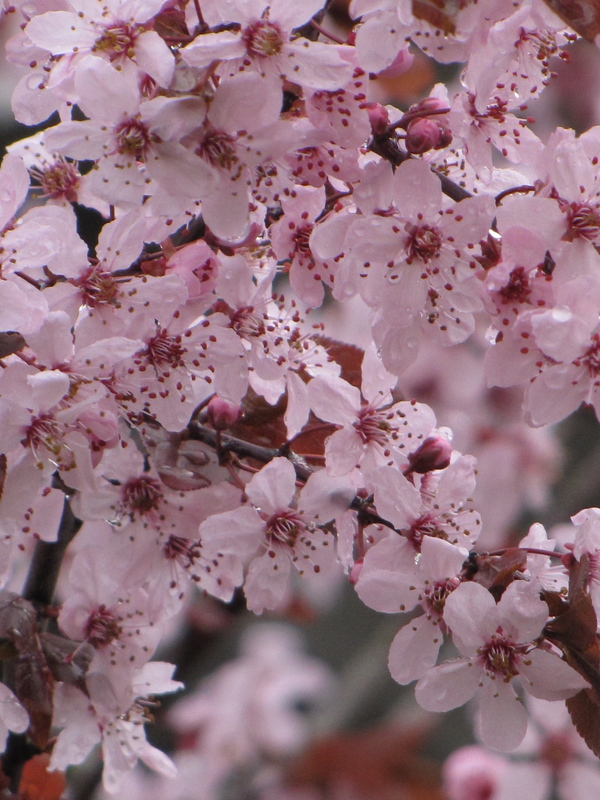 There are two main groups of cherry trees and they are in the family Prunus and they are either fruit bearing or ornamental. 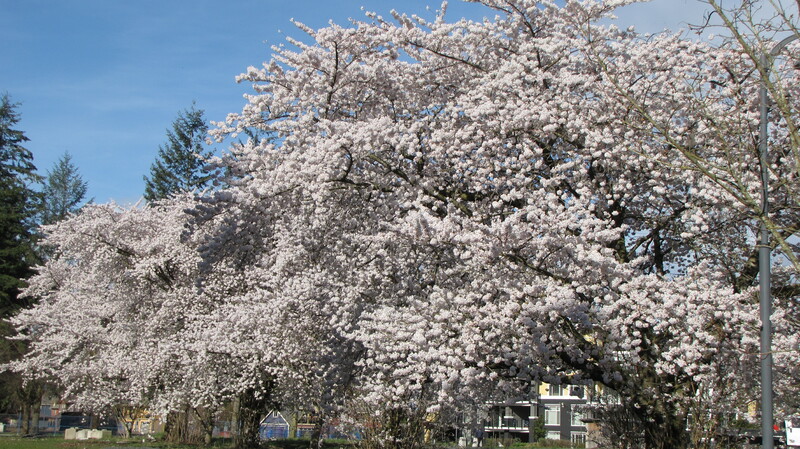 The fruit bearing trees are in orchards and in the summer they produce wonderful, big ‘Bing’ cherries. 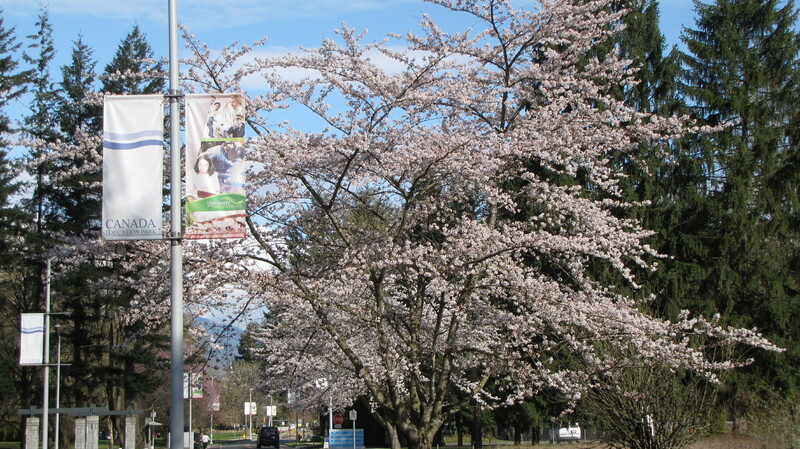 Its the ornamental trees that are featured in the Cherry Blossom Festival. 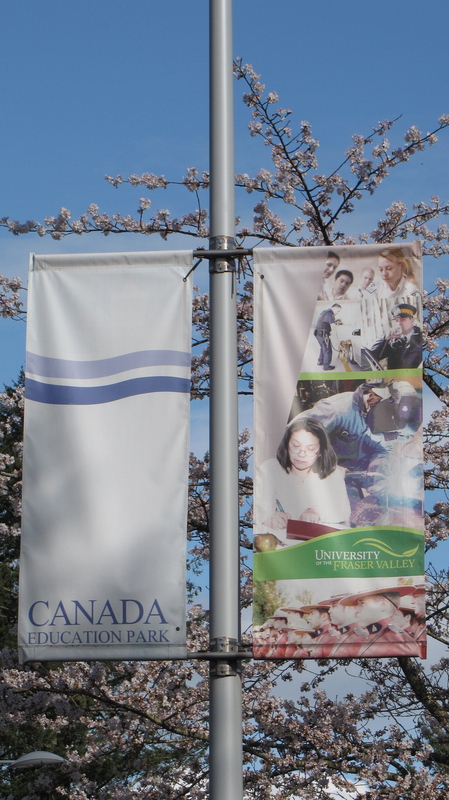 There are 5 festivals around the world each spring: Vancouver Canada, Toronto Canada, Georgia in the USA, Washington D.C. USA, and of course the most famous one in Japan. 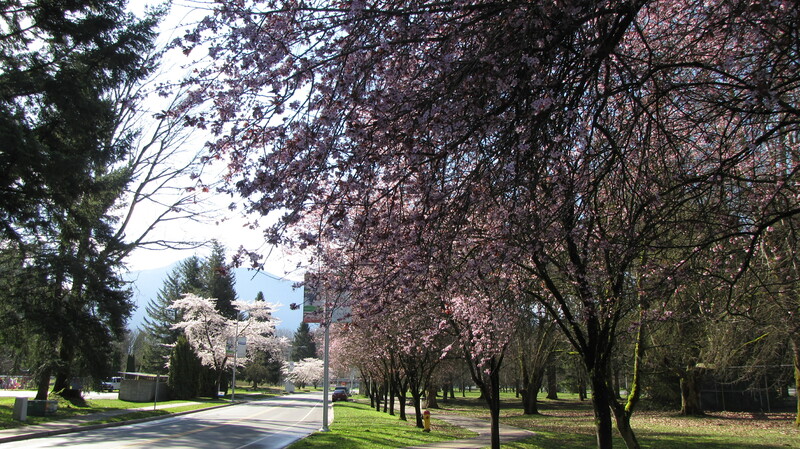 Cherry trees along Dieppe St. in the Canada Education Park. 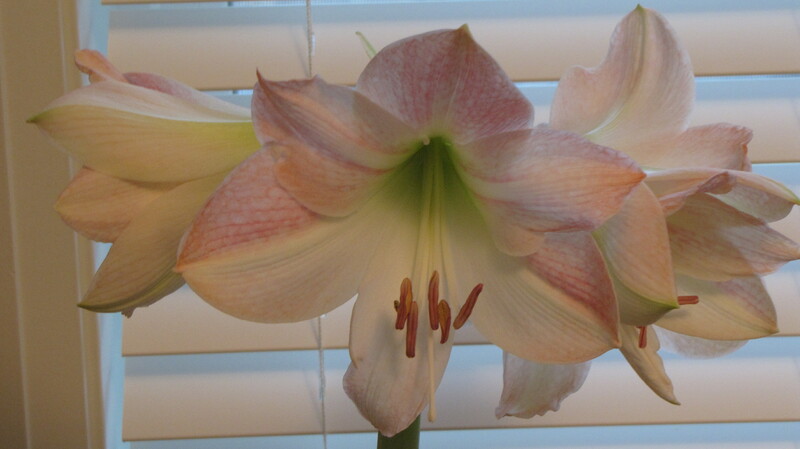 Ok, I had never heard of a plant named Hippeastrum before but in real true ‘plant talk’ it is the correct name for the winter blooming plant we know and love in North America as Amaryllis. 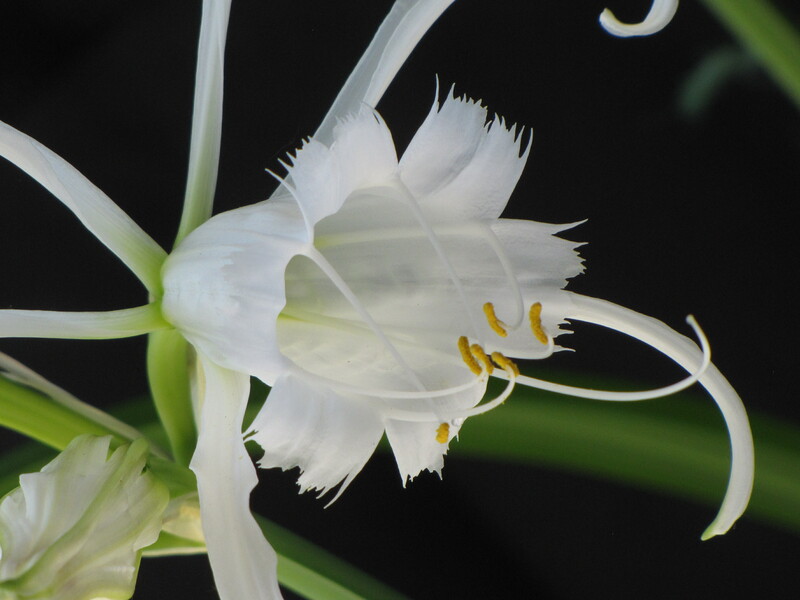 The confusion has been going on since famous Swedish botonist and ‘Father of Plant Latin’, Carl Linnaeus named a plant brought to him as Amaryllis. In those early days, the 1700’s, all South African and South American plants were lumped together. 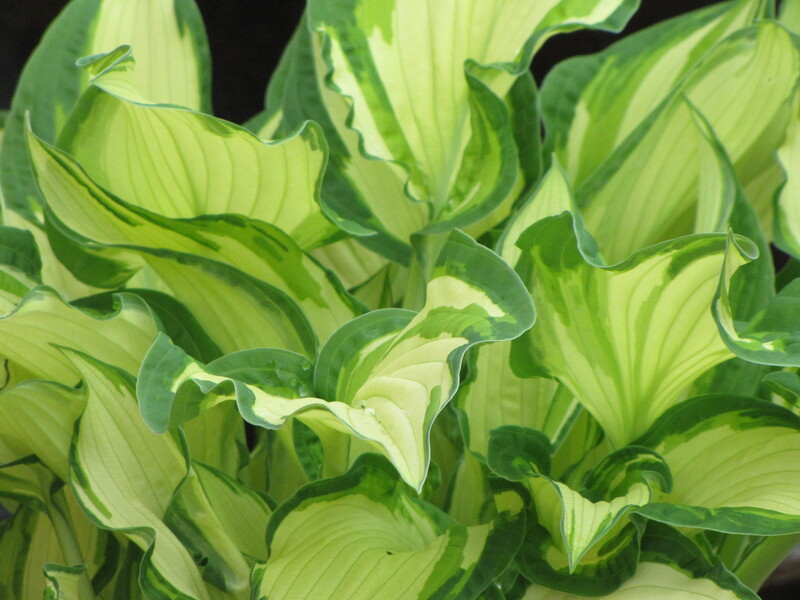 So it was not known at the time if the plant Linneus named was South African or South American in origin. This is an important point because the two plants were different, the plant we enjoy in North America is of South American decent. 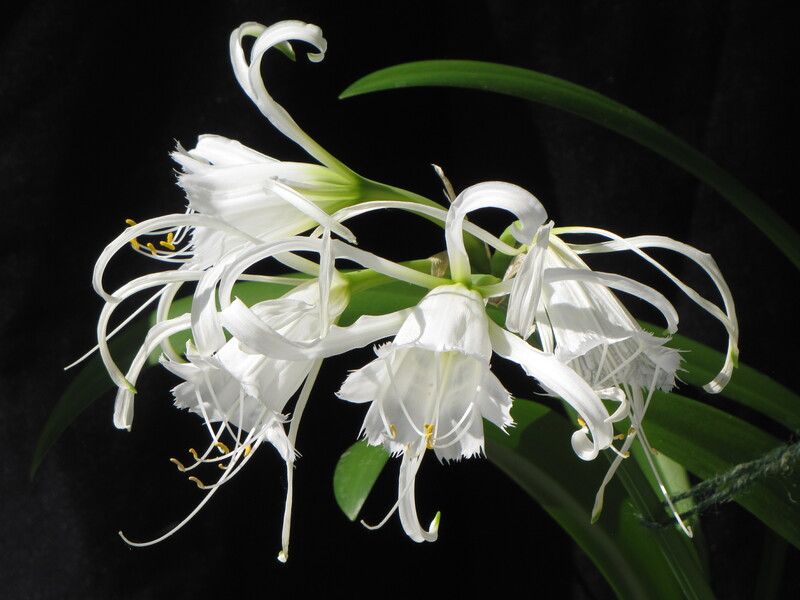 Finally it wasn’t until 1987 at the 14th International Botanist Congress it was decided to use the name Amaryllis as the common name for the cultivars of the genus. 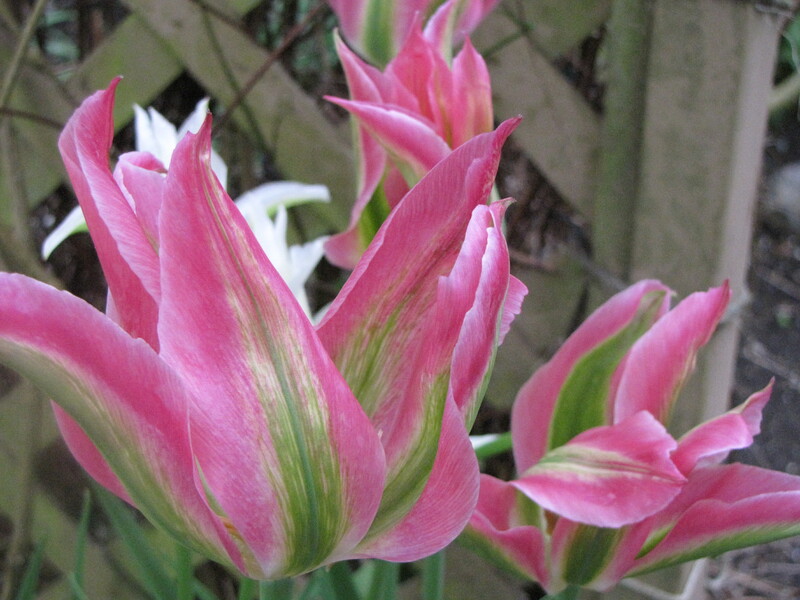 By contrast the generic name Amaryllis applies to the bulbs from South Africa which bloom naturally outdoors. 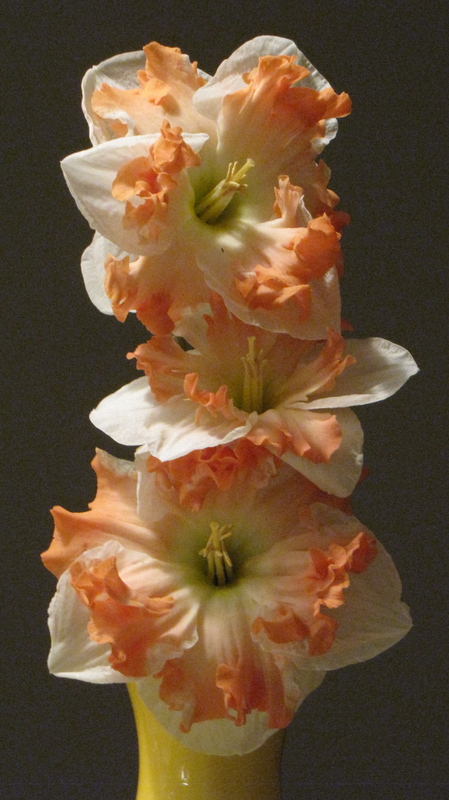 So once the dust settled the South African Amaryllis is known as amaryllis belladonna and the South American plant too is called amaryllis with the genus hippeasstrum. Confused? 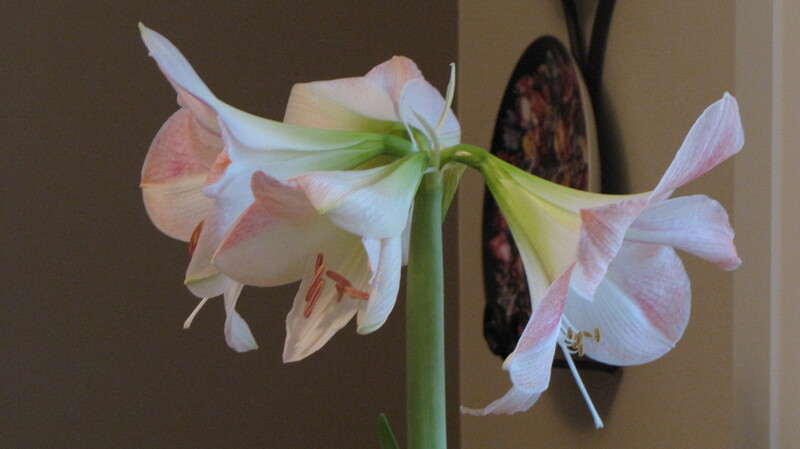 Hippeastrum is a genus of about 90 species and over 600 hybrids and cultivars commonly known as amaryllis. 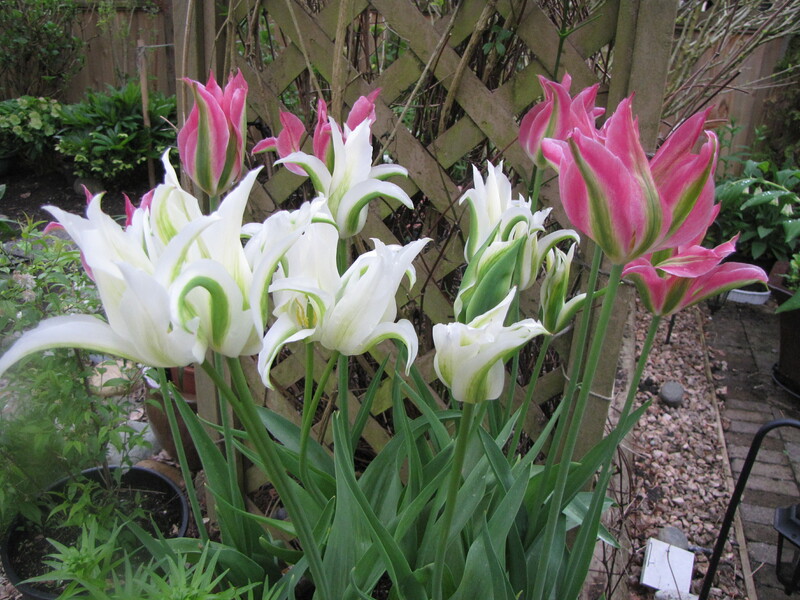 Yikes, I just know its lovely plus I collect ‘H’ plants so now I can add Hippeastrum to my collection! 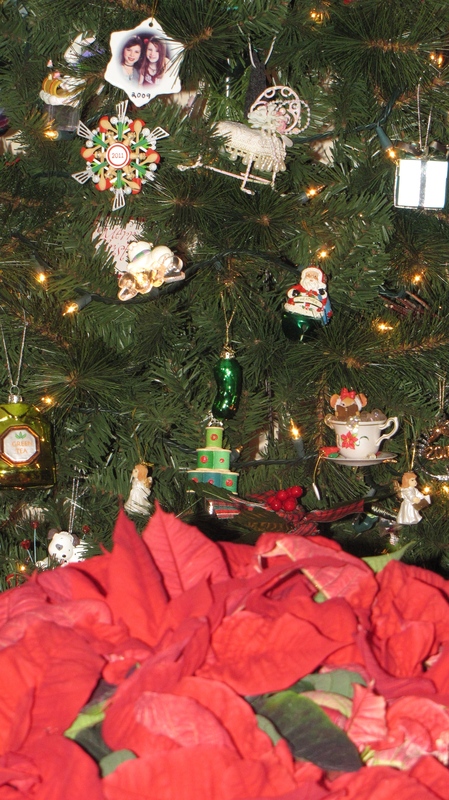 I love decorating my house but I especially love decorating for the holidays! (Actually its a big pain in the bum to drag out the Christmas bins, unpack everything then use the bins to pack up and put away all my everyday stuff, it’s so much work, but there is no complaining, its Christmas!) I would say my style is natural using decorations made from pinecones, wool, twigs anything with earth tones. 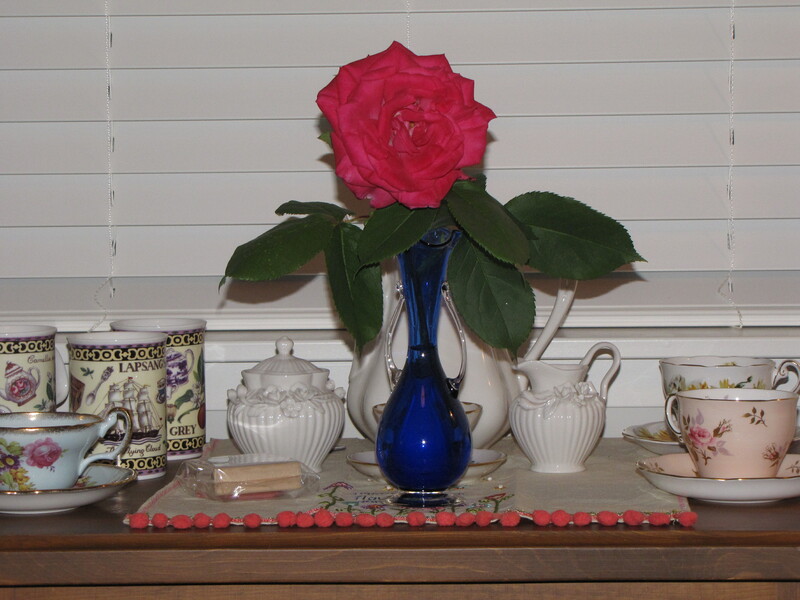 For my table I do have a lot of red, green and white dishes and I especially like ruby-red. 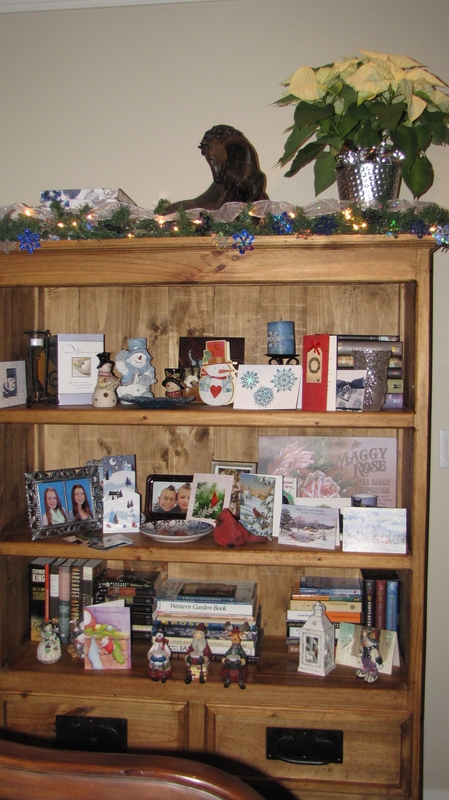 I save the bookcase for my silver and blue sceme, and this is where my snowman collection is displayed. 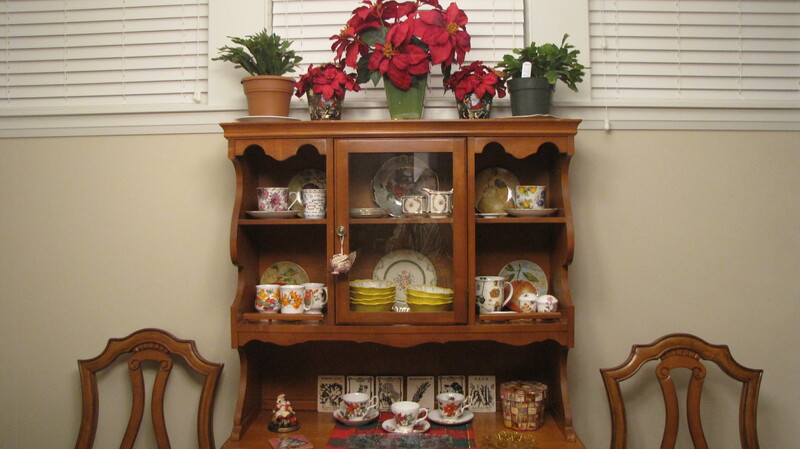 To finish off all the areas I add poinsettia plants. 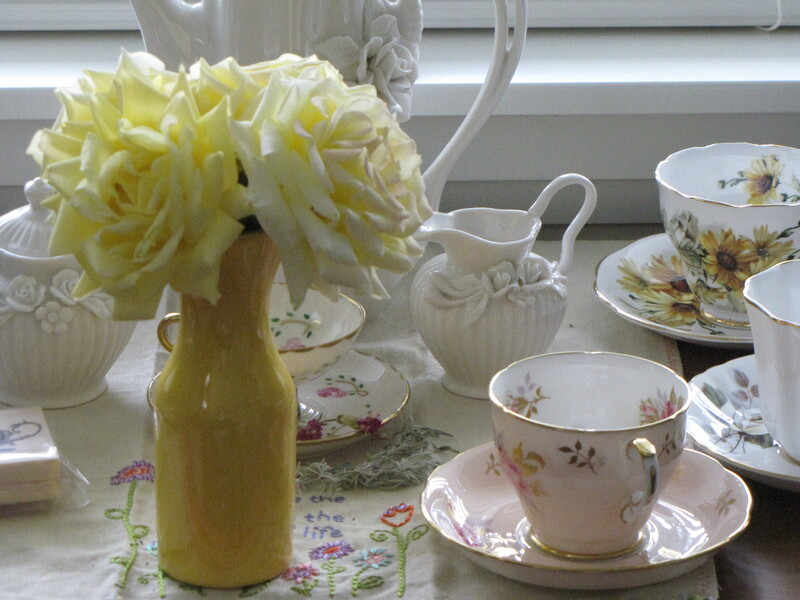 I like a cream coloured one for my bookcase and a red one for the tall table behind the couch. On top of my grandmother’s little china cabinet I put the silk ones, some are gold and rather tacky up close but look great from a distance, the bonus of silk is they never have to be watered and they can be used year after year! Of course I have a collection of poinsettia cups. 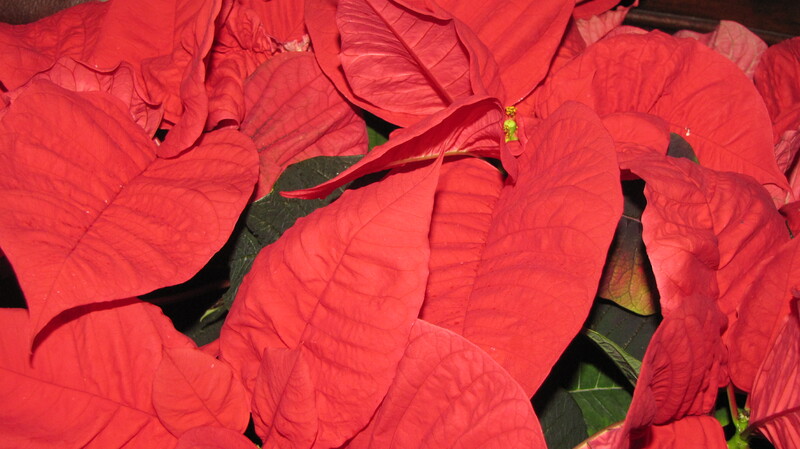 Poinsettias are native to central America and they are also known as the Mexican Flame Tree. They grow wild all over Mexico especially in an area known as ‘Taxco del Alaron’, the poinsettia plant is from the family Euphorbiaceae, the genus Euphorbia and the species E. pulcherrima which means ‘the most beautiful Euphorbia’. 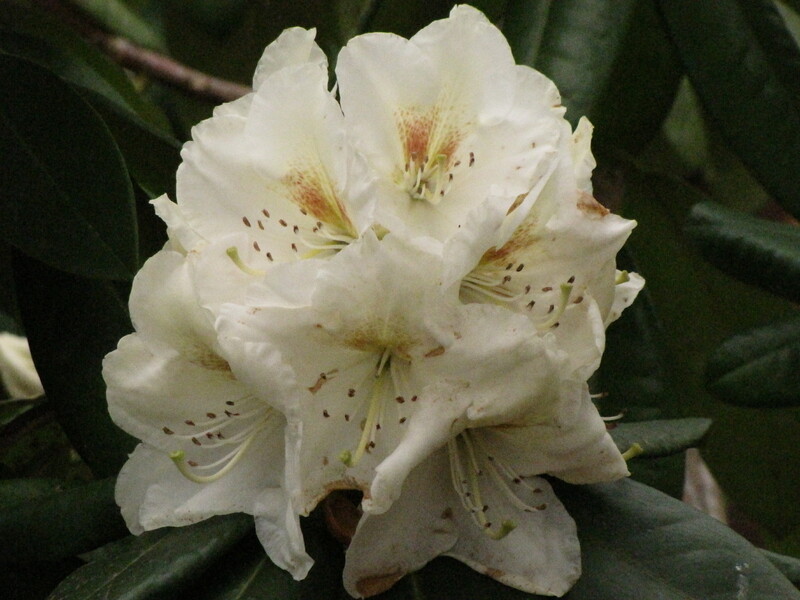 The plant was introduced to the United States by Joel Robert Poinsett the first US ambassador to Mexico. 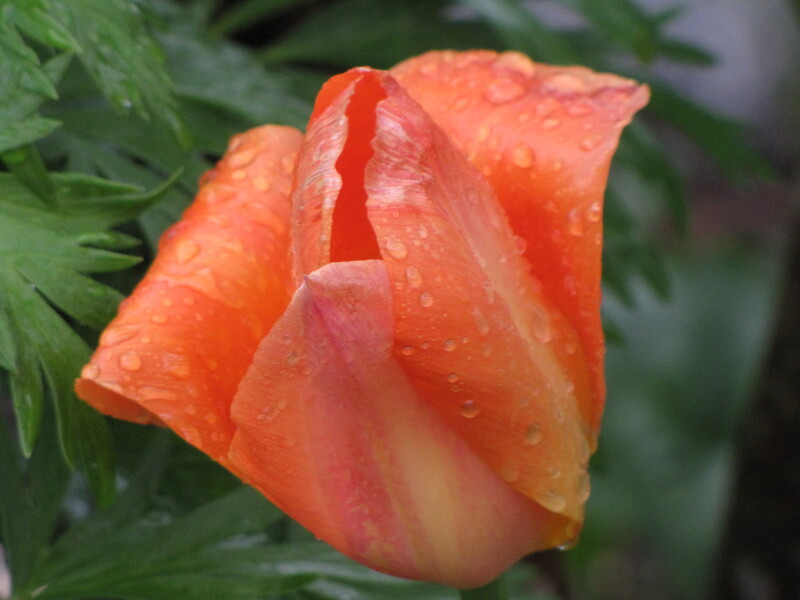 He was also a botanist who grew them in his nursery so his name became associated with the plant. 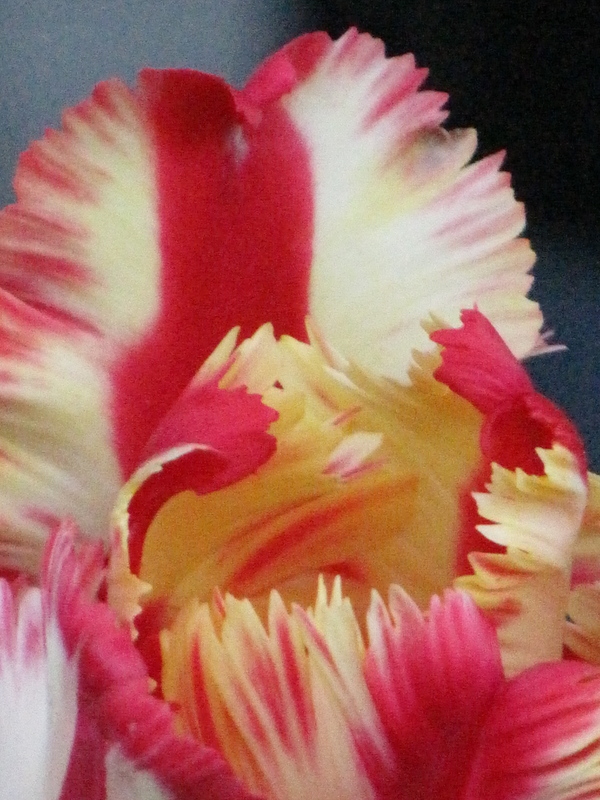 Other growers took interest and the industry spread around the world. 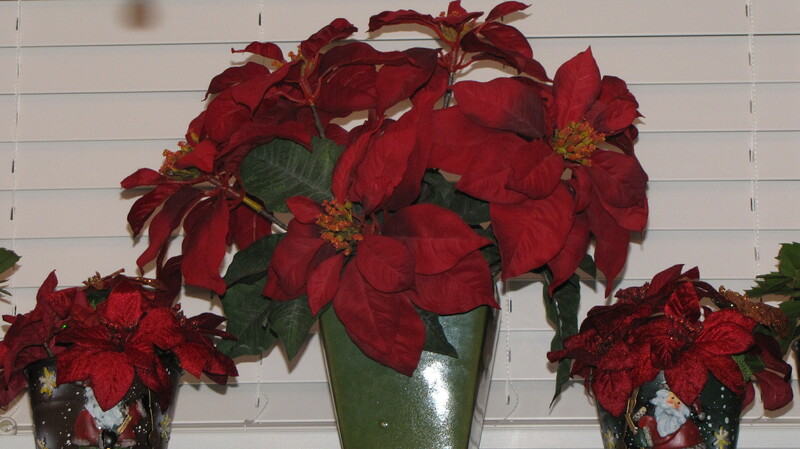 The poinsettia is the national emblem of Madagascar and December 11th is National Poinsettia Day in the USA. They now range in colour from white cream, yellow, cinnamon to every shade of red, I like them because they are only available at Christmas so they add a natural element to my festive holiday displays. 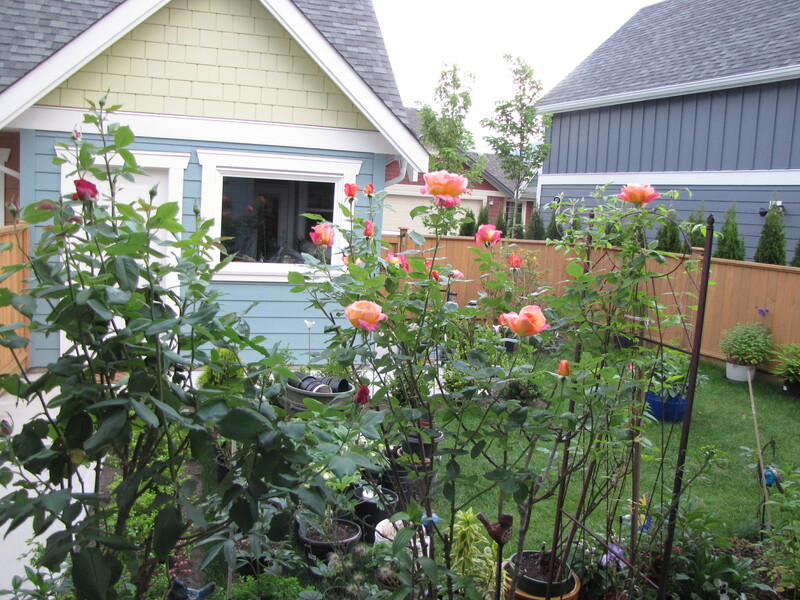 I have to say looking back I had a great summer in my new garden, all the plants survived a cold winter in their pots until I could plant then out this past spring. 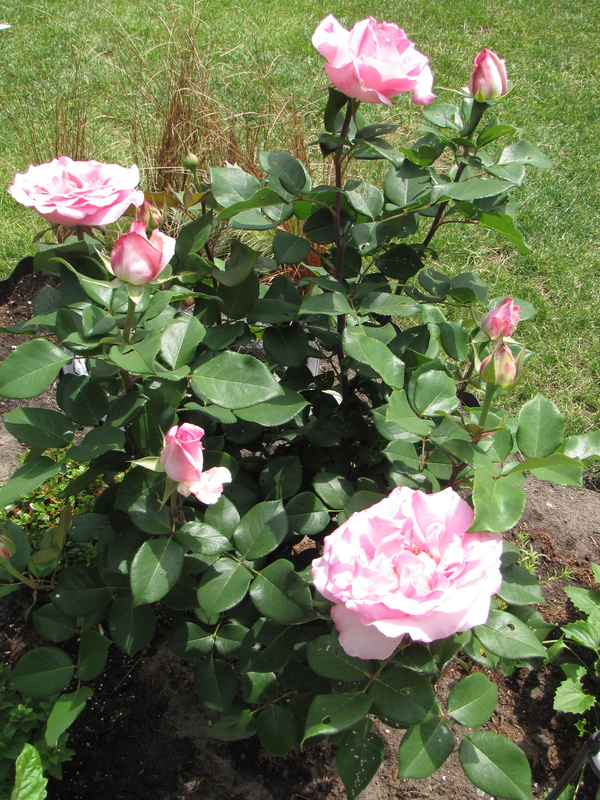 Along with about 70 perennials I moved five rose bushes from my previous garden: ‘Irish Gold’, ‘Peace’, ‘Blue Girl’, ‘Chicago Peace’ or she could be ‘Love and Peace’ very old, never identified, and ‘Peter Mayle’. 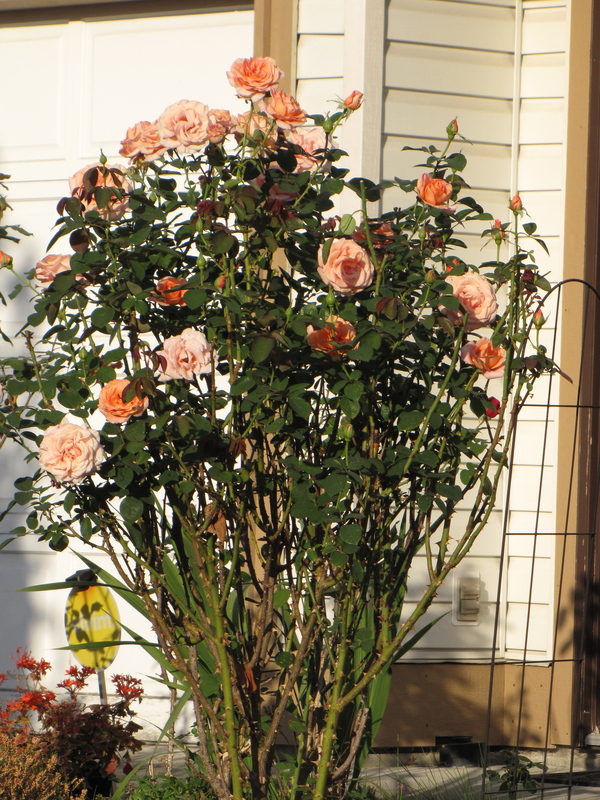 Peter Mayle and Chicago Peace were big rose bushes so they had to be wintered in massive, ceramic frost-resistant pots. Fun to move too, they weighed about 100 pounds each! My uncle still has the scar from unloading one of them off the truck! I went on to purchase ‘John F. Kennedy’, ‘Black Baccara’ and ‘Love’. 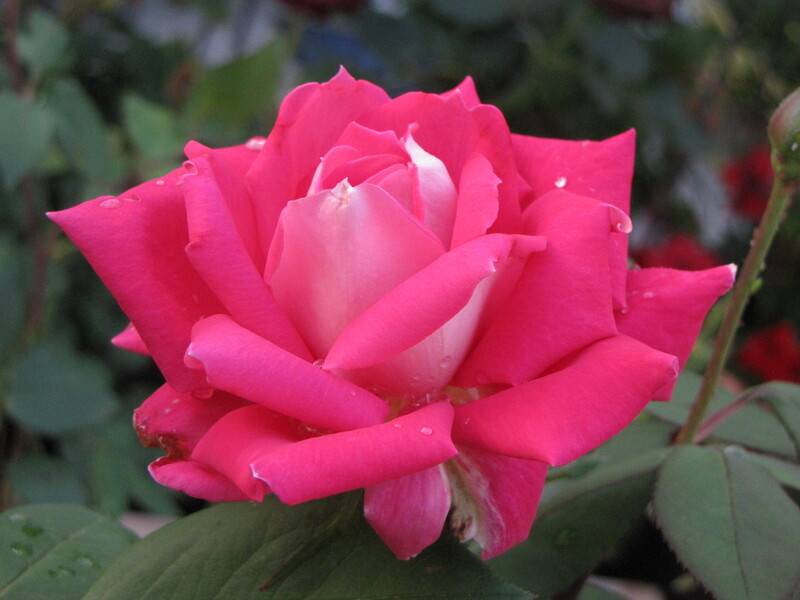 I also attended the opening weekend at Select Roses in Langley British Columbia where I brought home a new, pink, baby girl named ‘Beverly’. 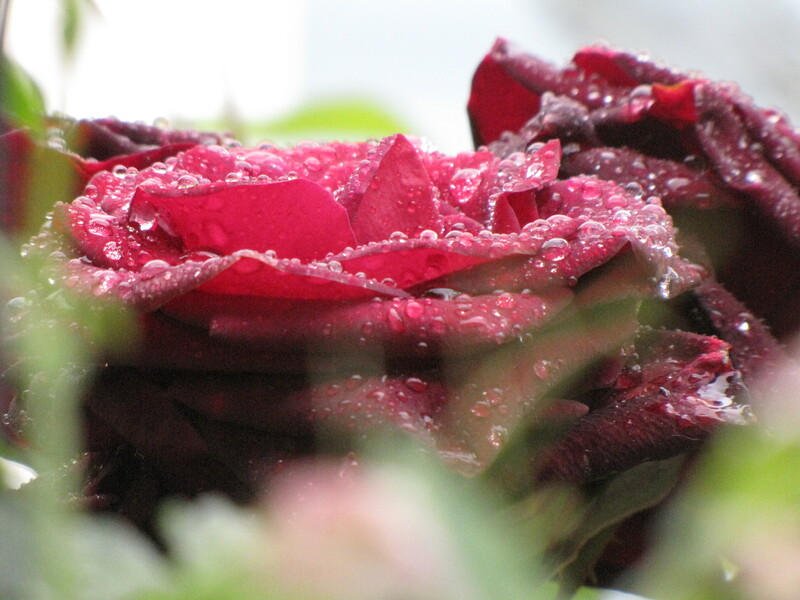 I hope you enjoy the photos of the My Roses of Summer! This is my big beauty who has never been 100% identified, she starts off yellow/pink and opens to more of an orange/pink. 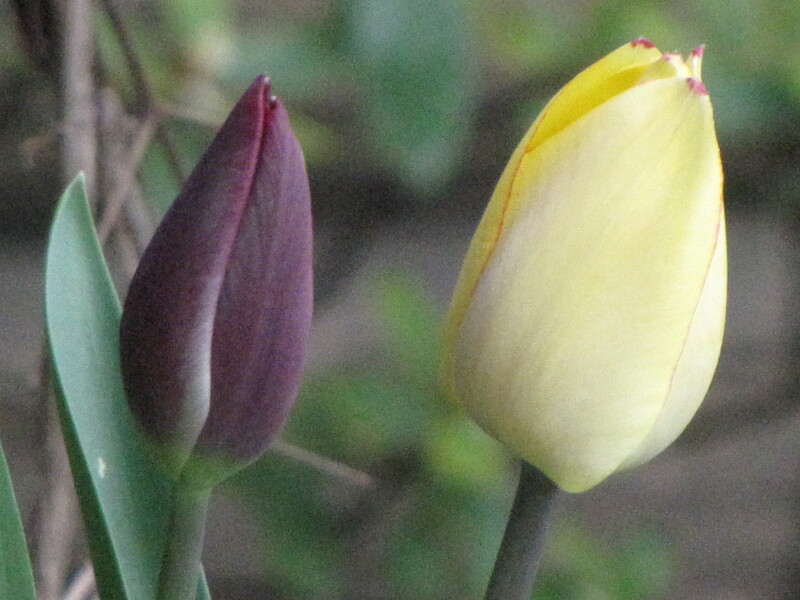 Honestly, there are never two buds the same! 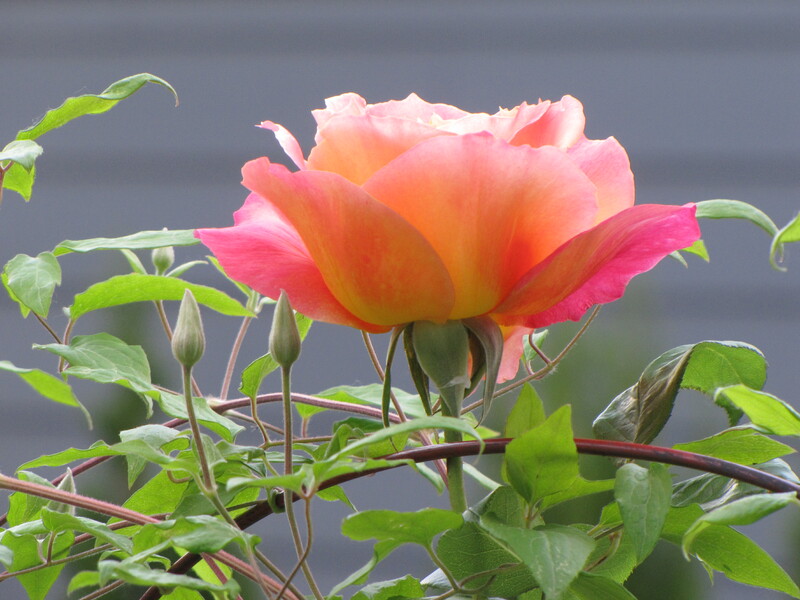 This is rose has very large blooms, she blooms early in my Pacific North West, Fraser Valley climate with the best show in early May. She was already there when we moved into our first house 17 years ago and at that time the house was 13 years old so I think she is over 20 years old and still out blooms the best of them! 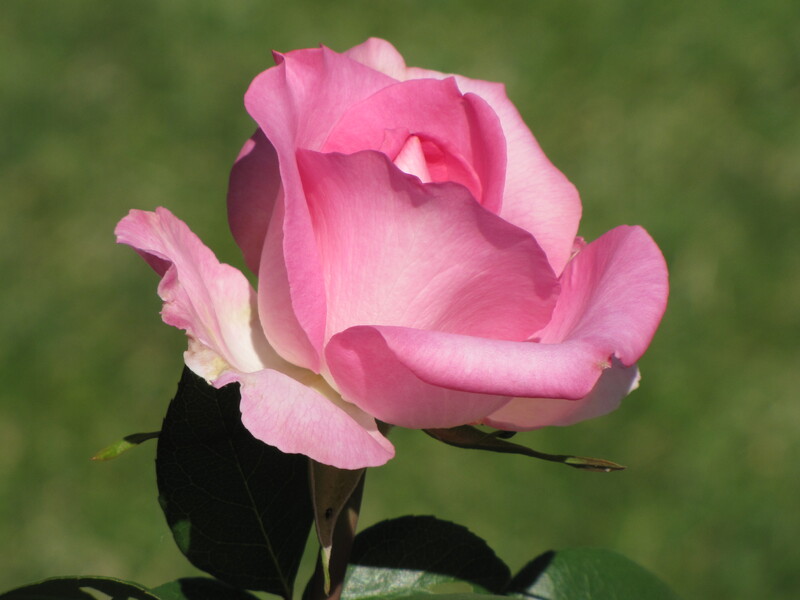 This is a lovely hot pink rose named for Peter Mayle, a famous British author known for his series of books about life in Provence, France. 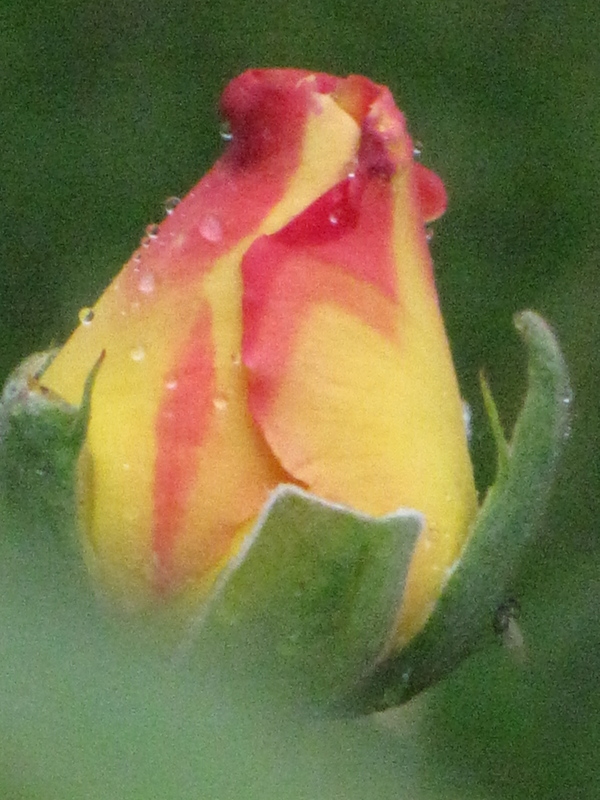 My Peter Mayle, let’s call him a boy, is a long way from France but he seems very adapted to my rose garden. 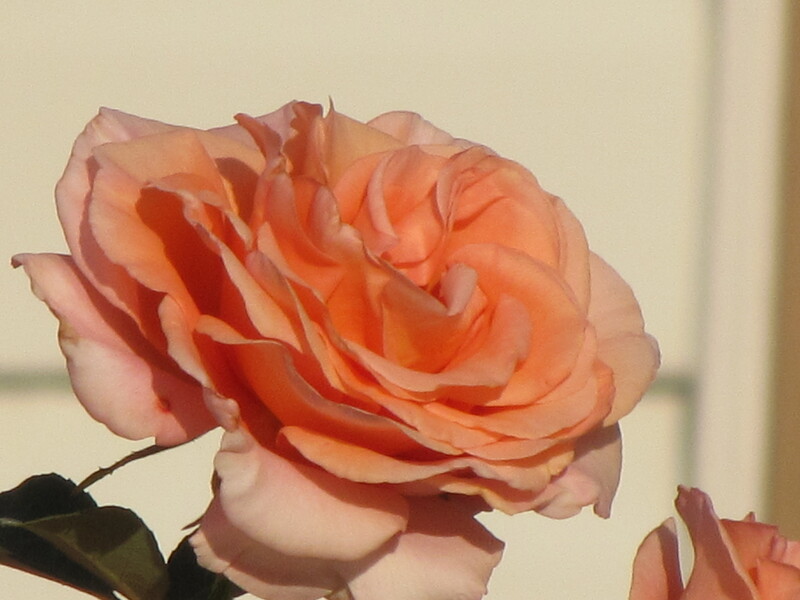 I entered four cuttings in a rose show in 2011 and came away with 4 firsts so that tells you how showy the bloom is! 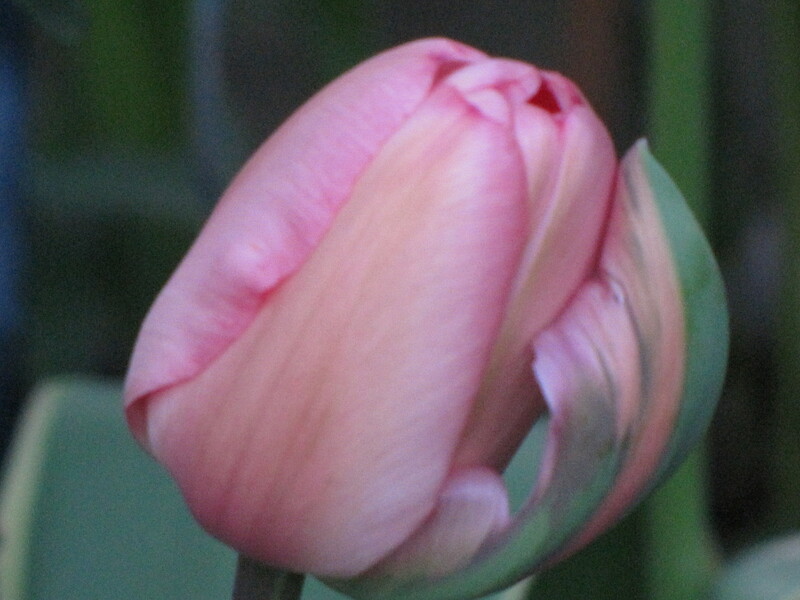 You can see him just starting to bloom in the above photo, off to the left. 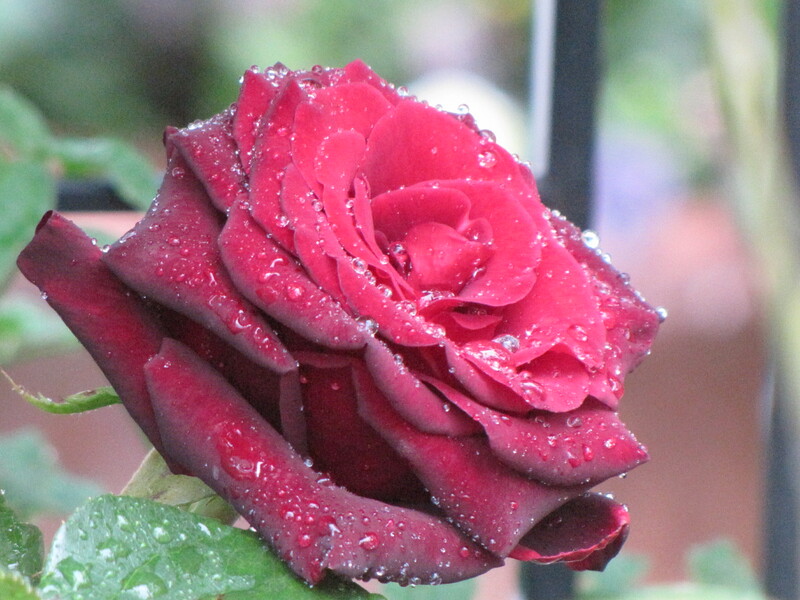 This is a rose that has been around for a long time. My Peace rose was a teeny, tiny little thing my cousin rescued from an excavation dig. It never really performed in my previous garden but in the new garden its has grown quite a bit and now commands attention! 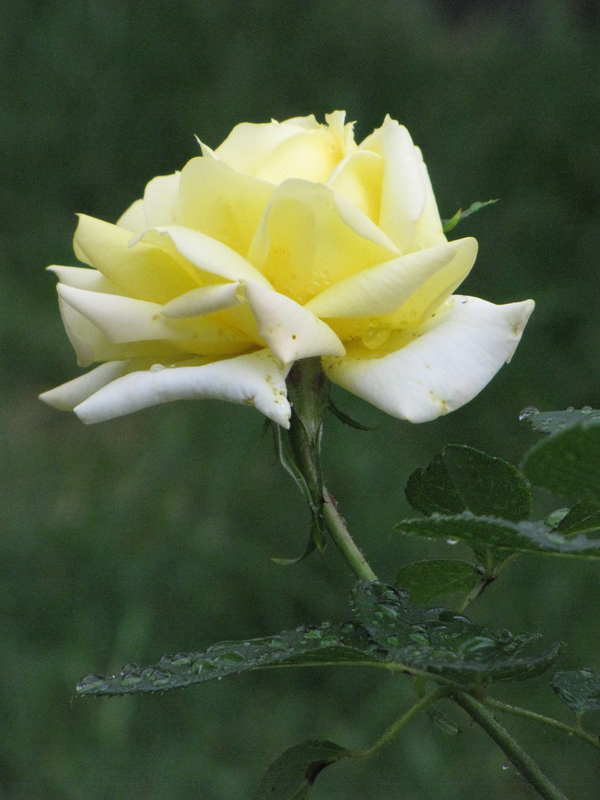 This was a rose I added this year, I like how the petals are white on one side and pinky/red on the other. 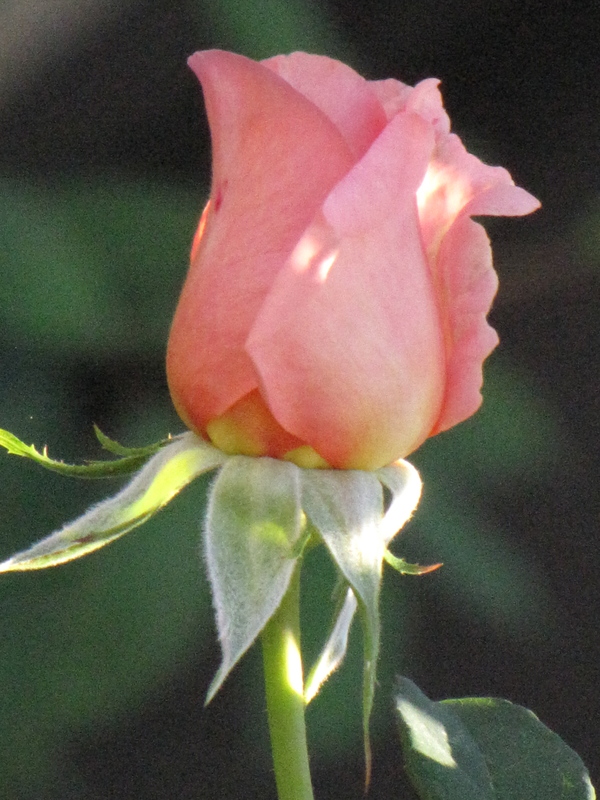 Its planted now in the new, raised rose bed so I hope this is enough for it to make it through the coming winter. 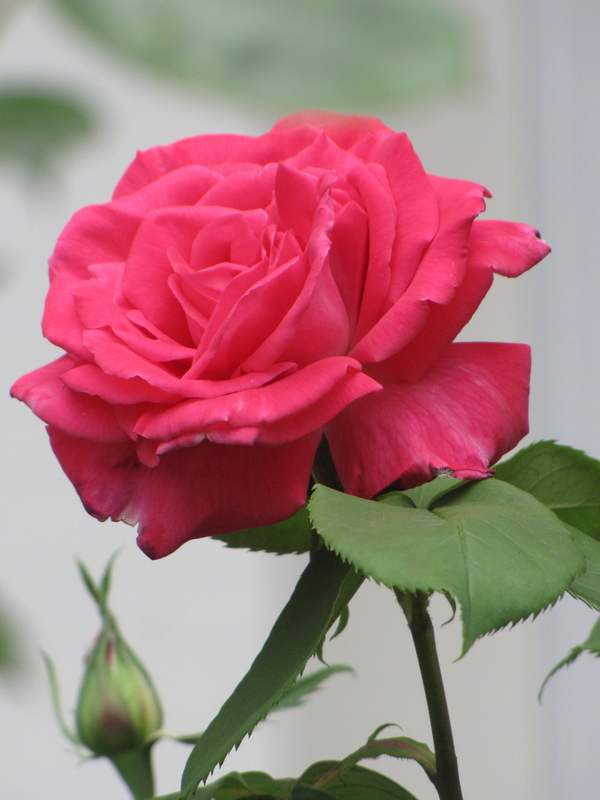 It is a fun rose with a darling name. OK, I admit I bought it for its name, it sounds fiery and fierce! 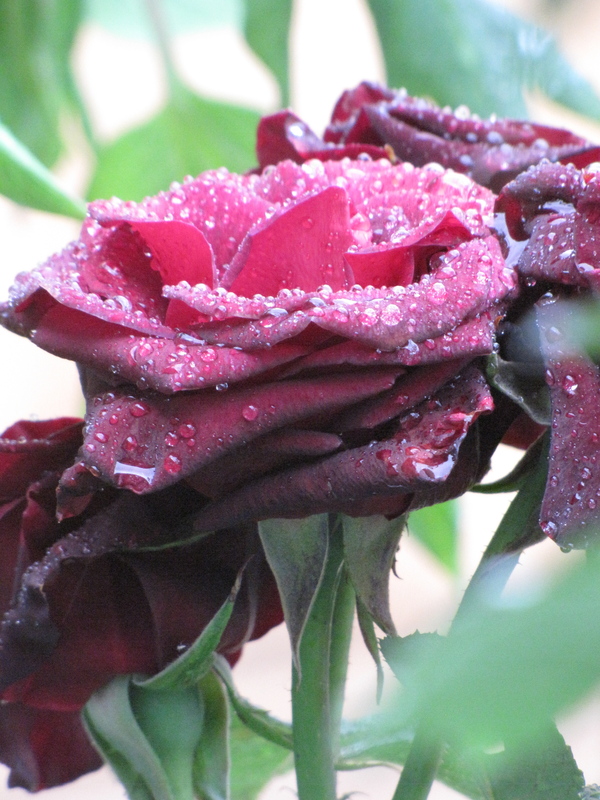 Black Baccara is one of the darkest roses available and the petals look and feel like velvet. 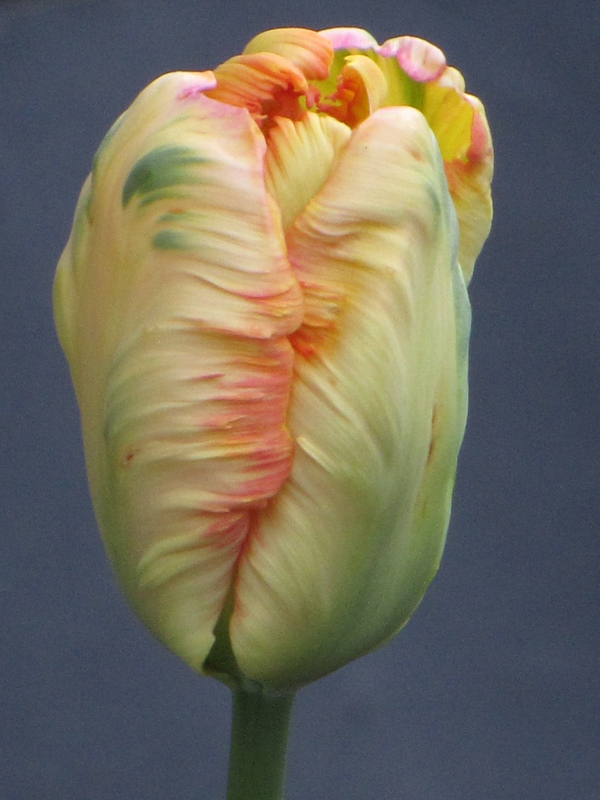 She is not the biggest bloomer but she is still getting her groove, once that happens she will be a show-stopper! 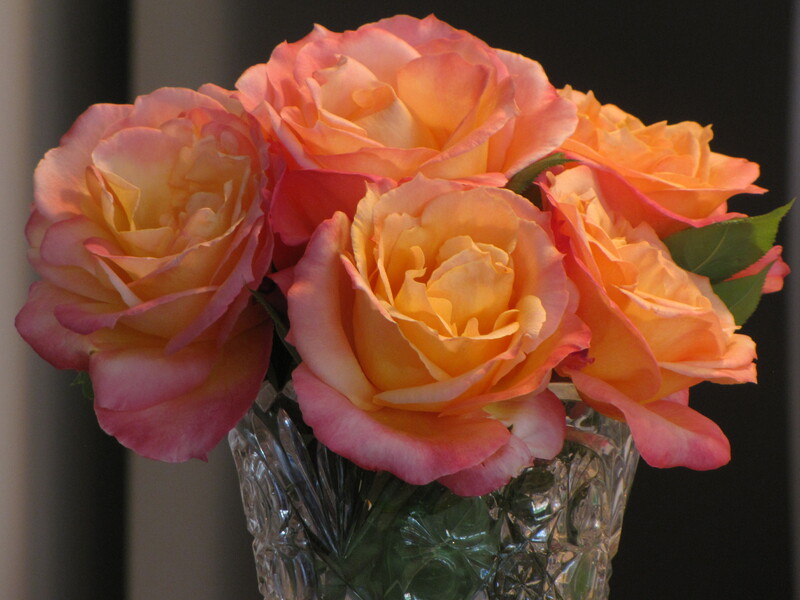 Select Roses in Langley is the place to buy high quality roses adapted to the North American climate. 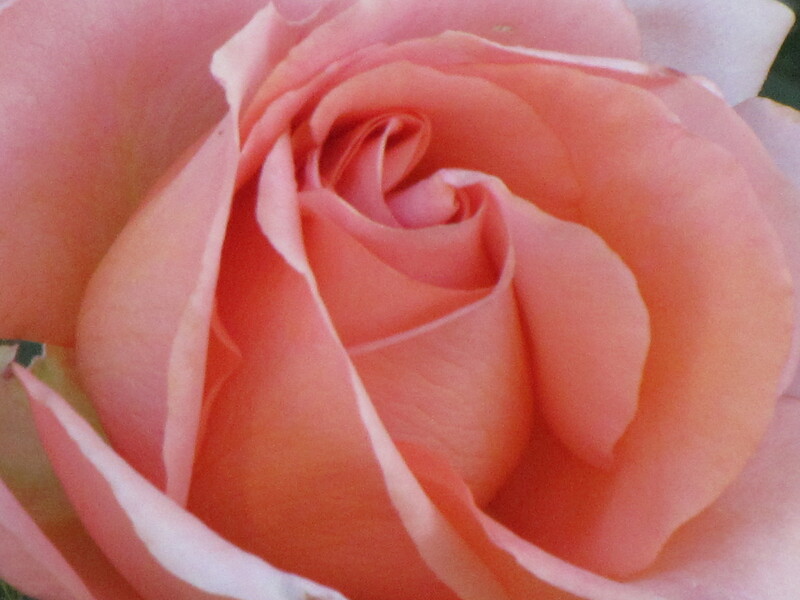 When I went there I was looking for a nice pink rose. 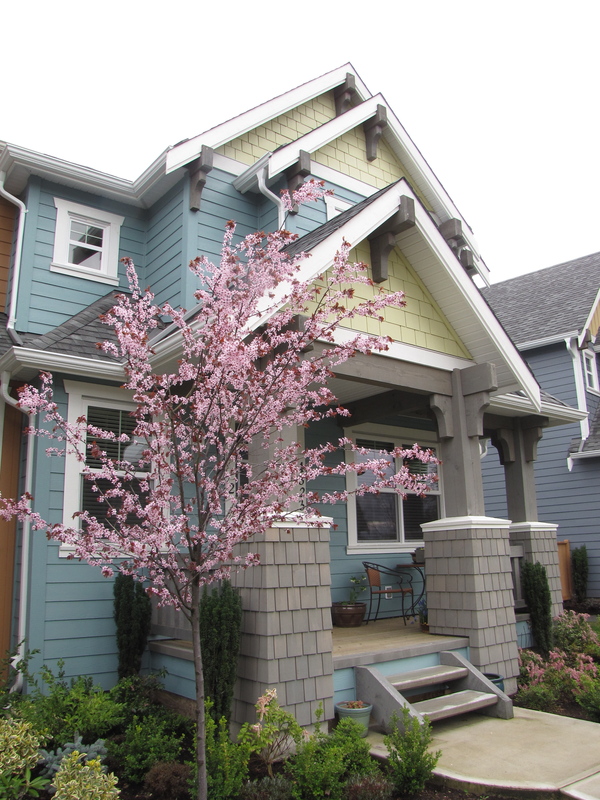 Brad Jalbert, the owner, suggested ‘Beverly’. 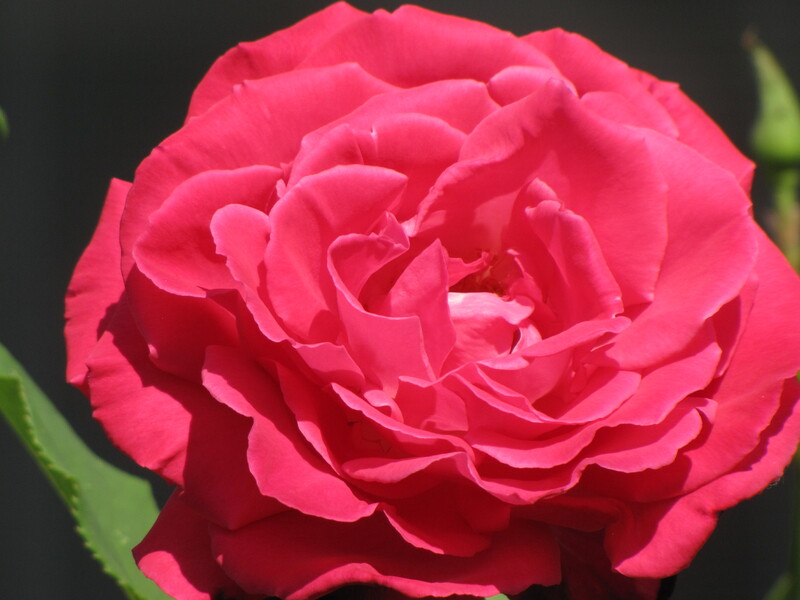 This is the most amazing rose I have ever had in my rose garden, as soon as the weather warmed up I planted her along the patio right in the ground. She settled in and went to work making bloom after bloom, she bloomed continuously all summer and is full of buds now, at the end of September. 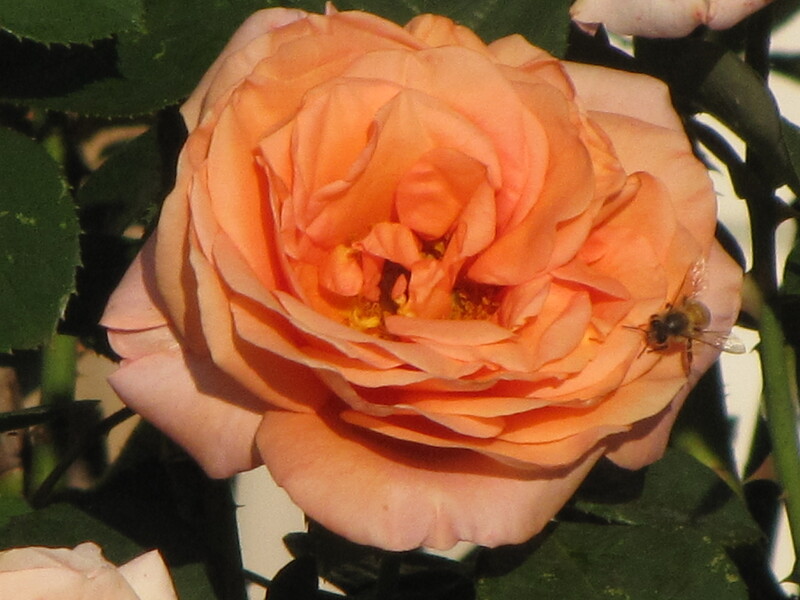 I plan to go back and buy an orange rose! 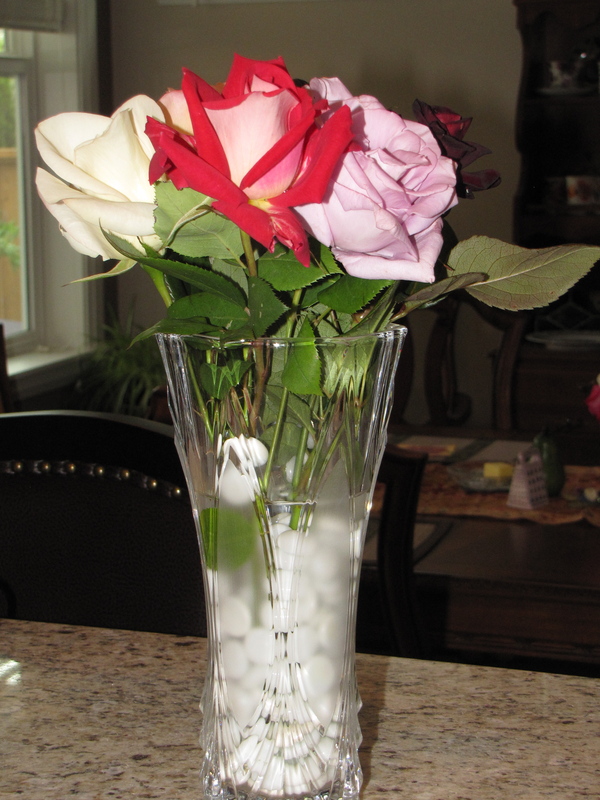 Vase of creamy white ‘J.F.K’, ‘Love’ and ‘Blue Girl’, and a vase of ‘Chicago Peace’. 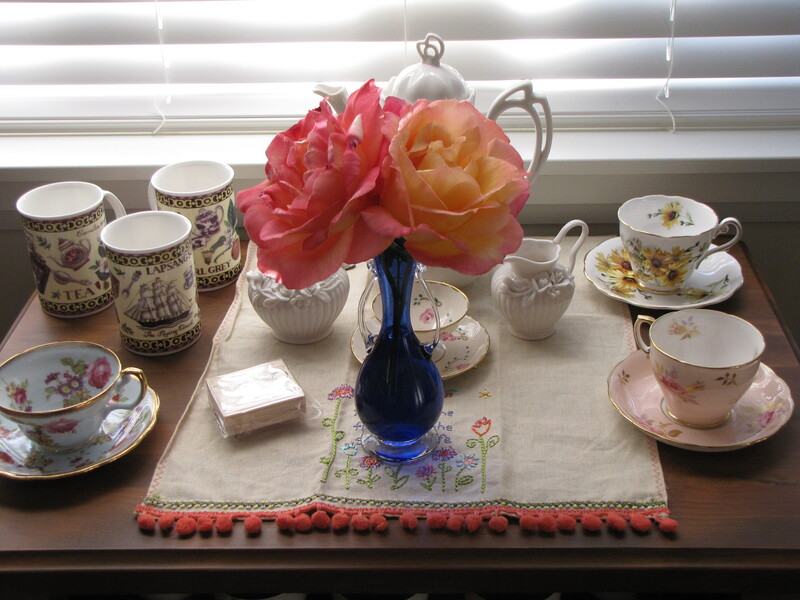 I hope you enjoyed seeing my Roses of Summer! 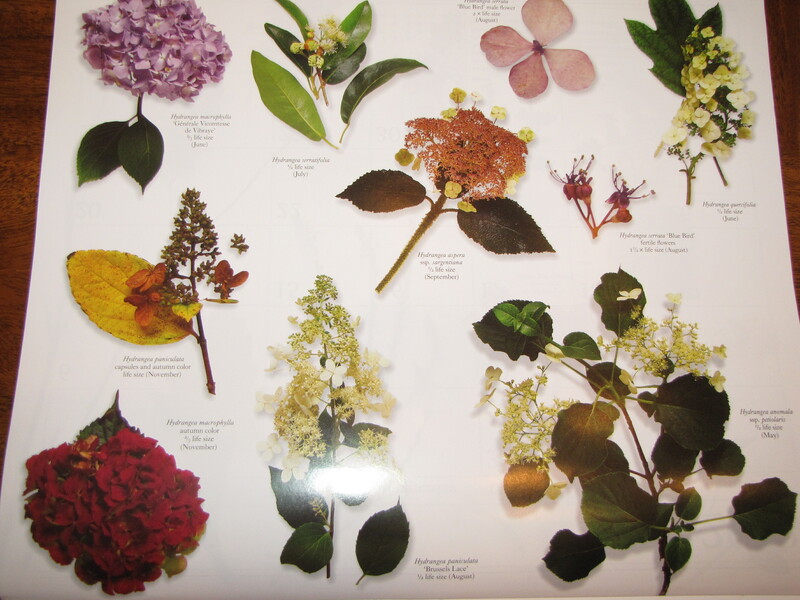 Hydrangeas are often overlooked in the garden but there is more to this reliable plant than meets the eye! 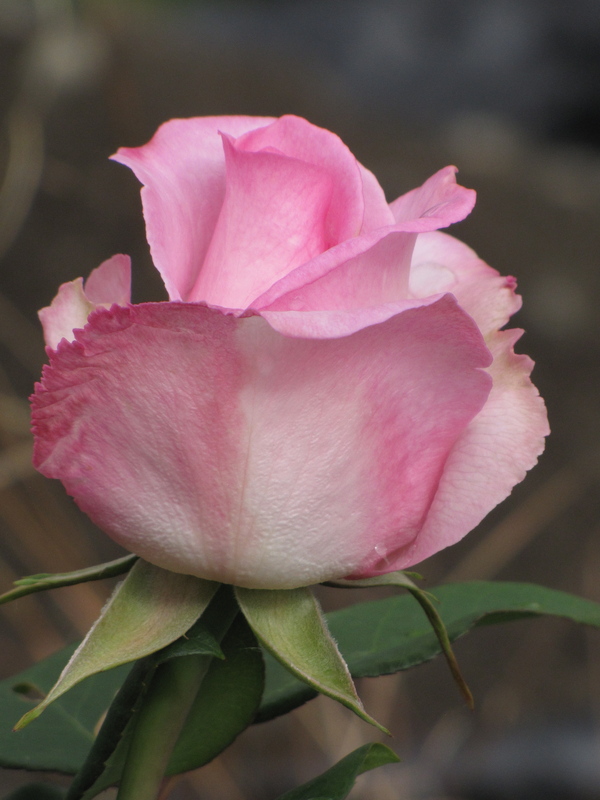 There are there over 40 different varieties and they don’t just bloom blue but white, pink, purple and all shades in between depending on the soil conditions. Its fun to experiment with the soil to see if you can get the plant to change colour, it’s not as easy as it sounds. 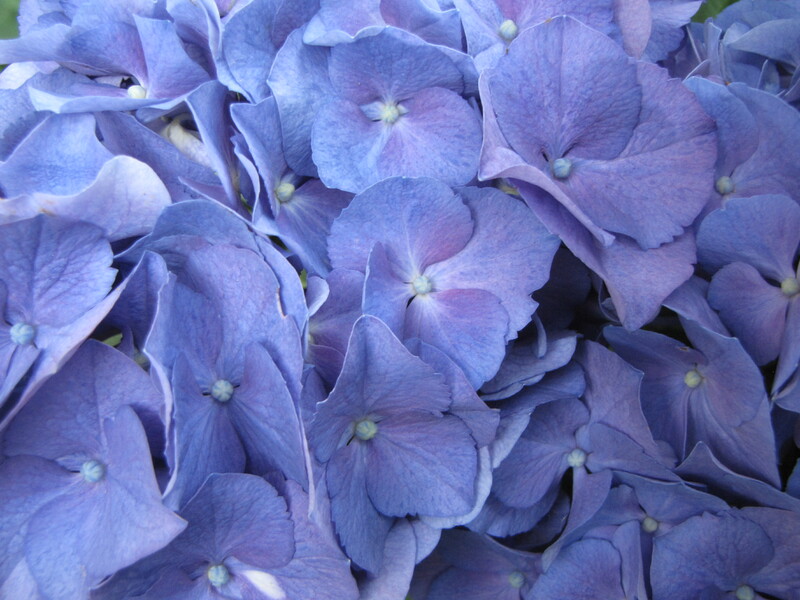 To change the colour of a hydrangea it’s a complex combination of soil acidity and aluminum levels. 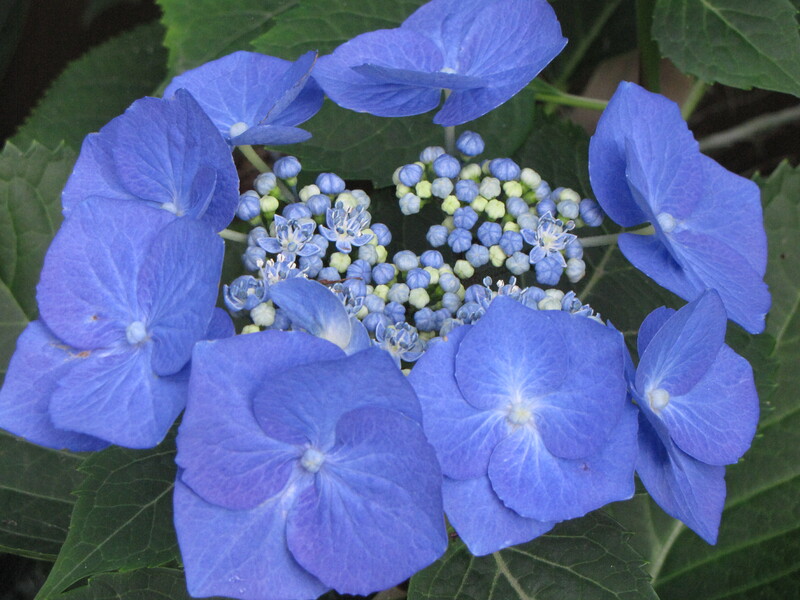 The hydrangea variety being grown will also determine the colour because some hydrangea don’t react to changes in the soil, if the hydrangea is white, it will stay white or be slightly tinged to blue or pink but nothing major. 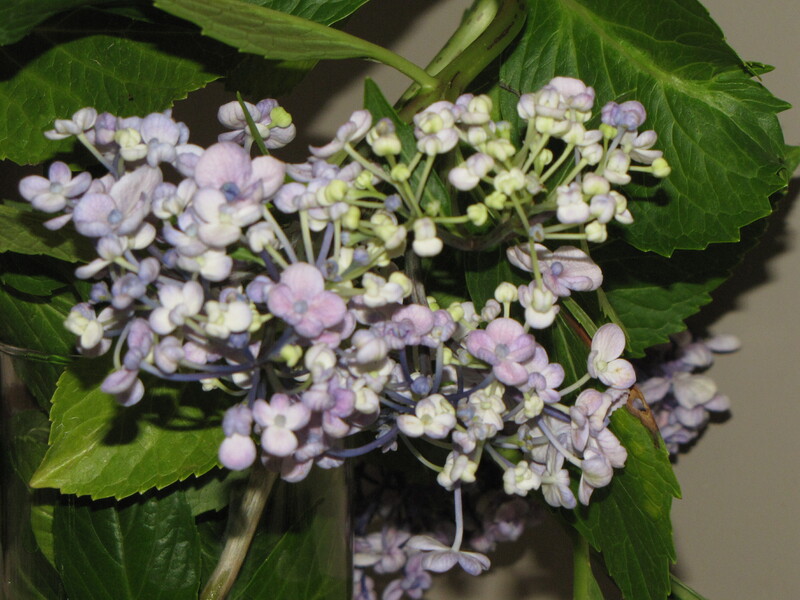 The easiest hydrangea to change the colour of is H. Macrophylla, this plant will produce blue flowers in acidic soil where more aluminum is present. The lower the PH of the soil the bluer the flowers. 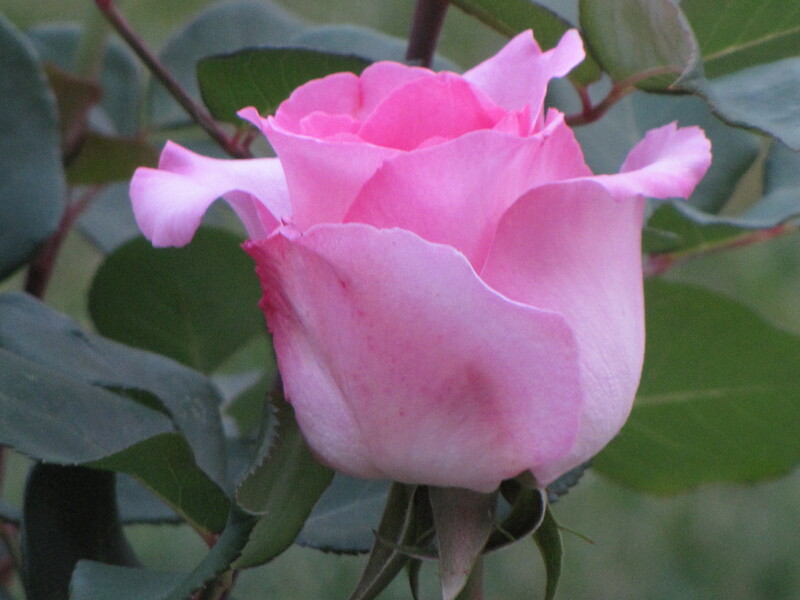 If the same plant were to be grown in neutral soil it would take up less aluminum and its flowers would be pink. 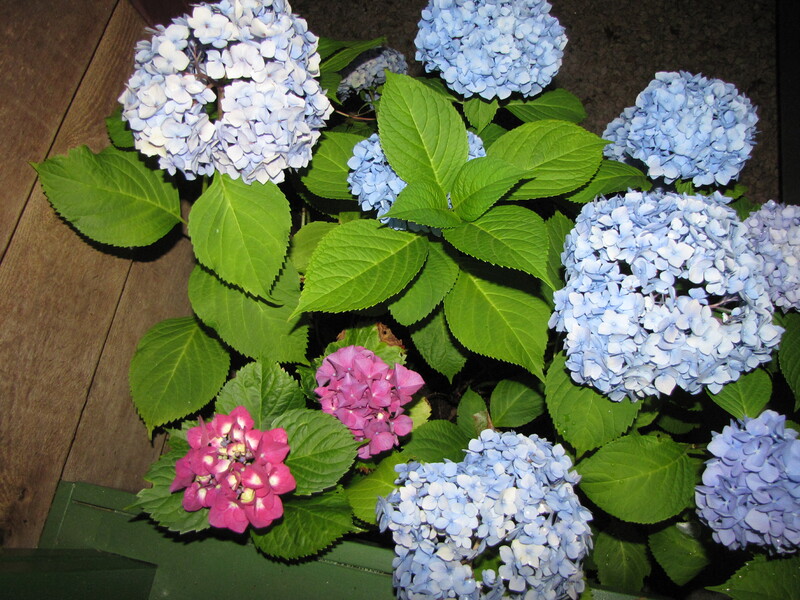 I have a pot of hydrangea cuttings I will soon transplant and they bloomed blue except there were two pink ones, all in the same soil! These Hydrangea are cuttings from H. Macrophylla ‘Altona’ , a globe or mop head hydrangea whose blooms can reach 1 foot across! These are babies that are only one year old and are off to a great start. One of my favourite hydrangea is the lacecap , it has male and female parts on each blossom, this photo is a plant I grew from a cutting. Hydrangea H. Aspera Sargentiana has really thick, fuzzy plush leaves, Hydrangea H. ‘Ayesha’ has mauve flowers that look a lot like a lilac, I just got some cuttings of this plant so I hope to grow one for myself. Hydrangea H. Quercilolia or oak leaf hydrangea is known for its amazing autumn colours. 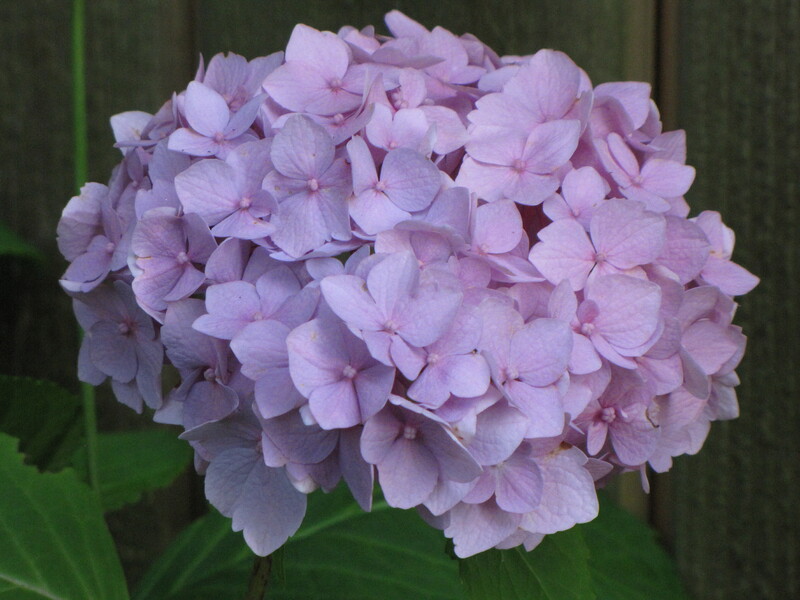 Hydrangeas are easy to grow and have no pests except they do like protection from direct sunlight and they need lots of water and mulch. 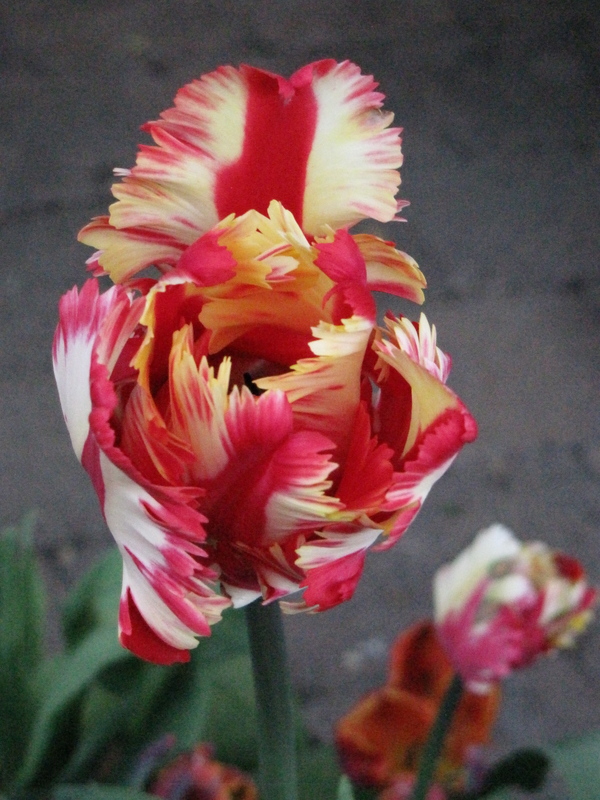 For me their biggest downfall is simply their size, they really aren’t suited for a small city garden like mine. But with this said all my cuttings will thrive when they are moved to our new, very large garden in the coming months! 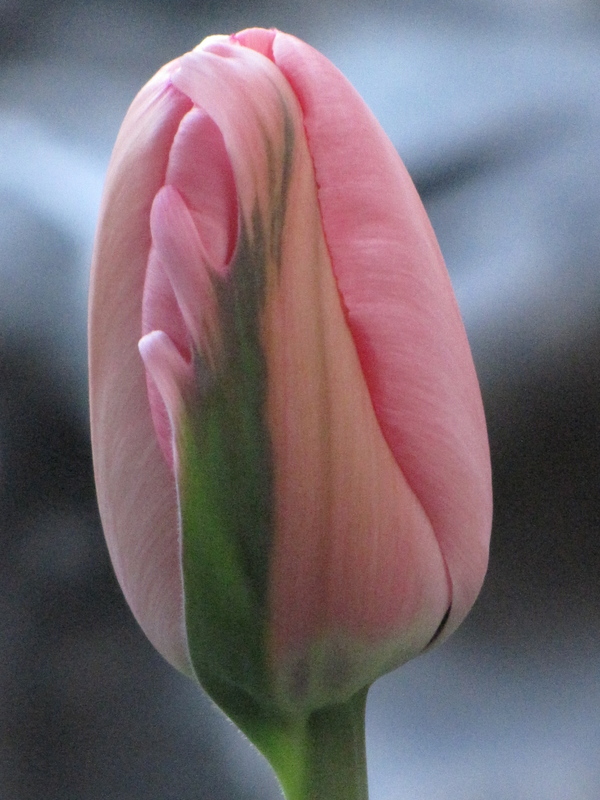 There they can grow to their full potential where they will no longer be overlooked….more details to come! 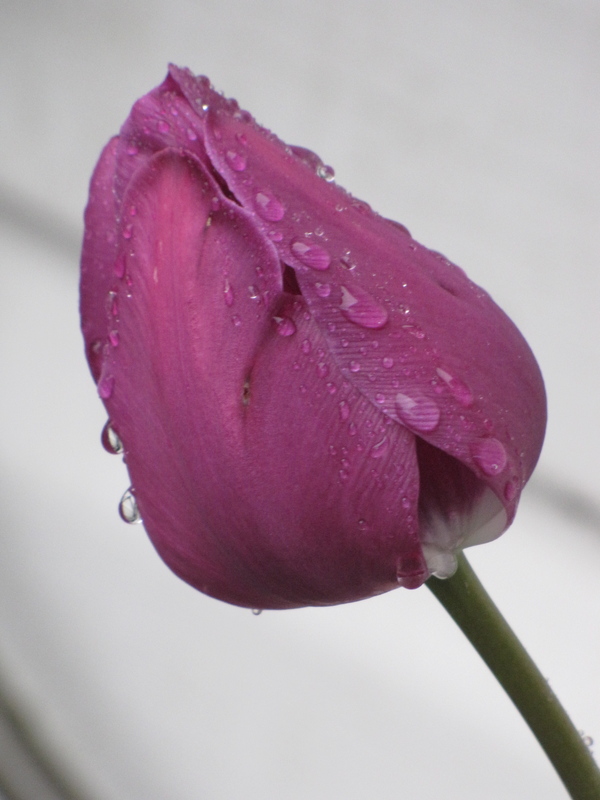 TULIPS…tulips come and go so fast in the spring I was happy to capture these at their best! 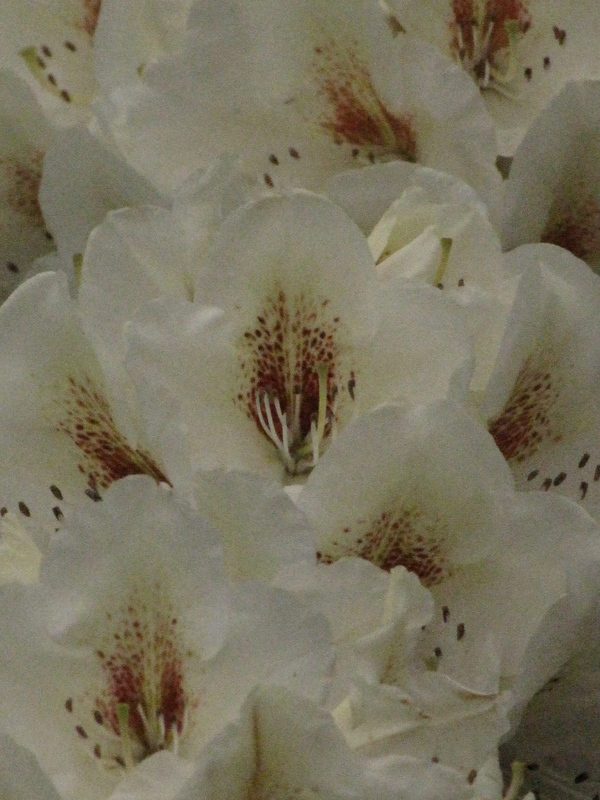 Rhododendron in Bloom! 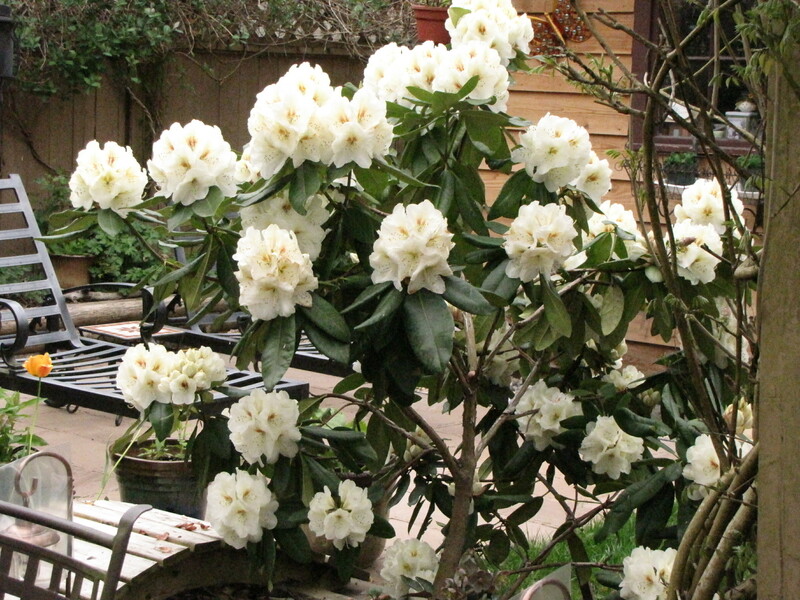 My big yellow/cream rhodo looks great right now, every branch has at least one massive bloom! 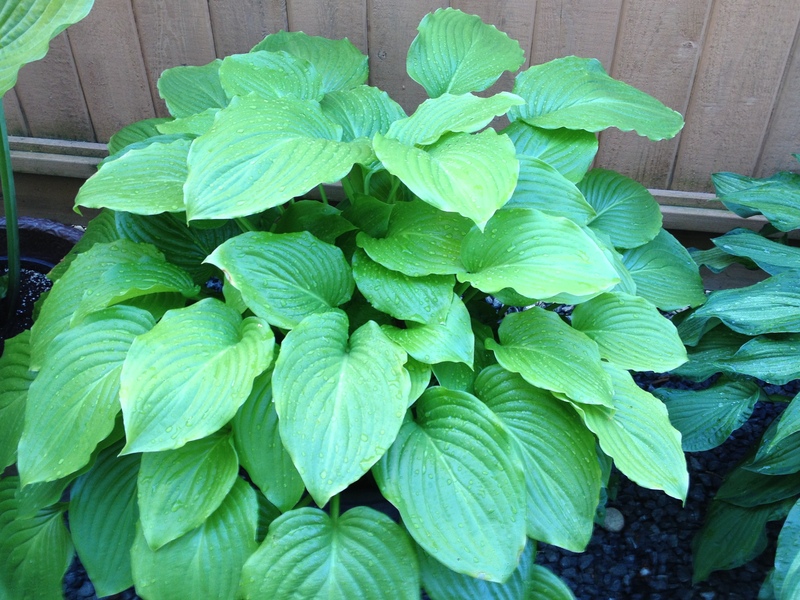 I have had this plant for 10 years, I bought it from a guest speaker at the Maple Ridge Garden Club who was selling cuttings for $1.00! That all it cost so its easy to see I have gotten my money’s worth! 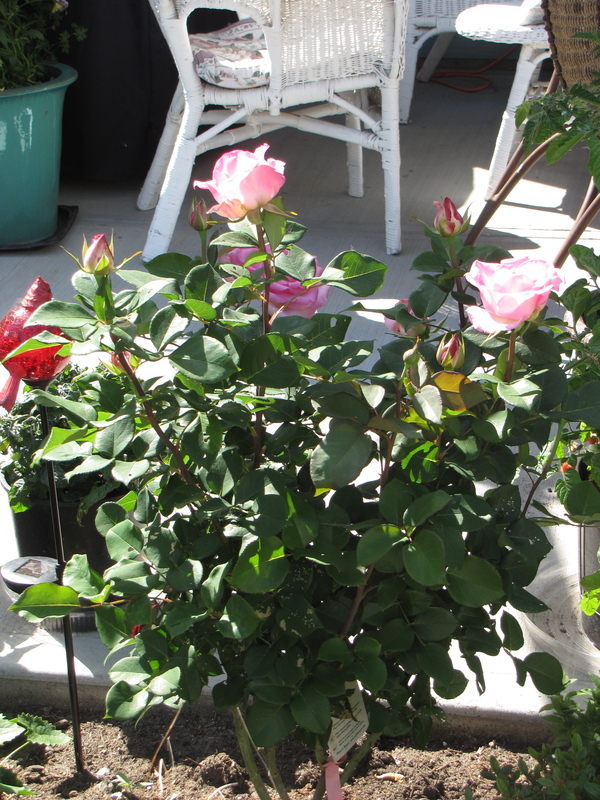 I want to share with you one of my many rose bushes I grow and nurture…as you can see my work pays off with countless blooms all summer long! 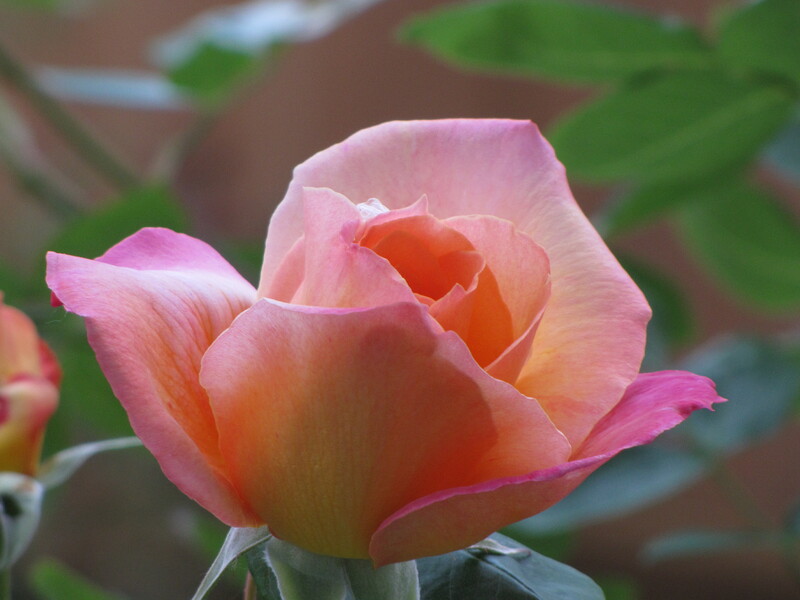 This rose is named Sunset Celebration and it is an award winner. 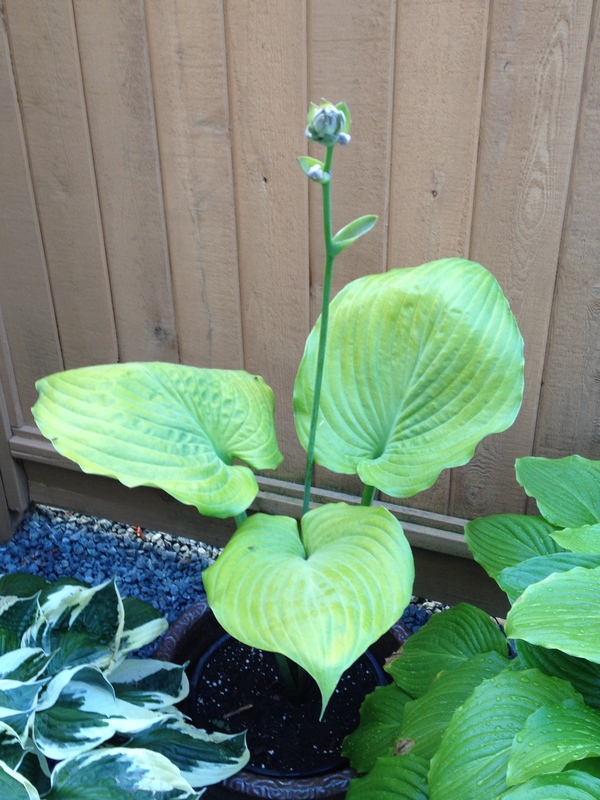 It gives big, showy blooms on straight stems. 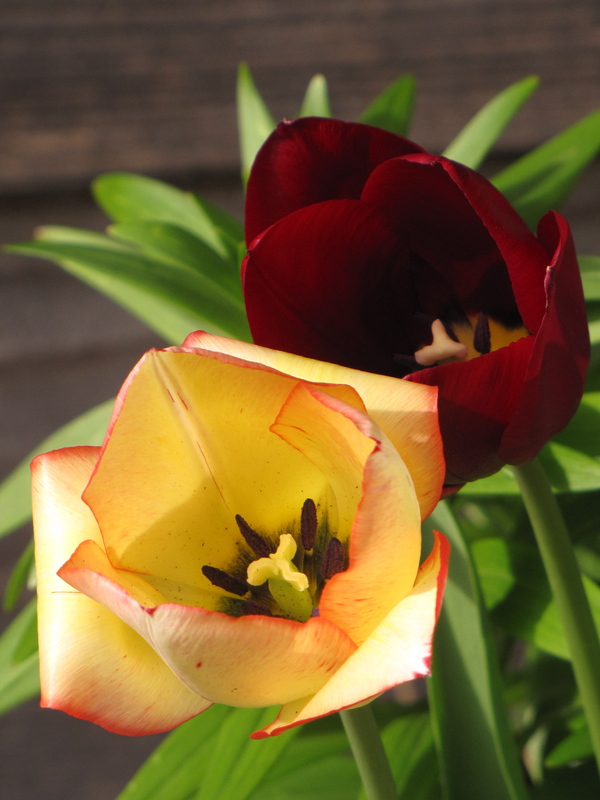 A great cut flower, it needs full sun and good air circulation.